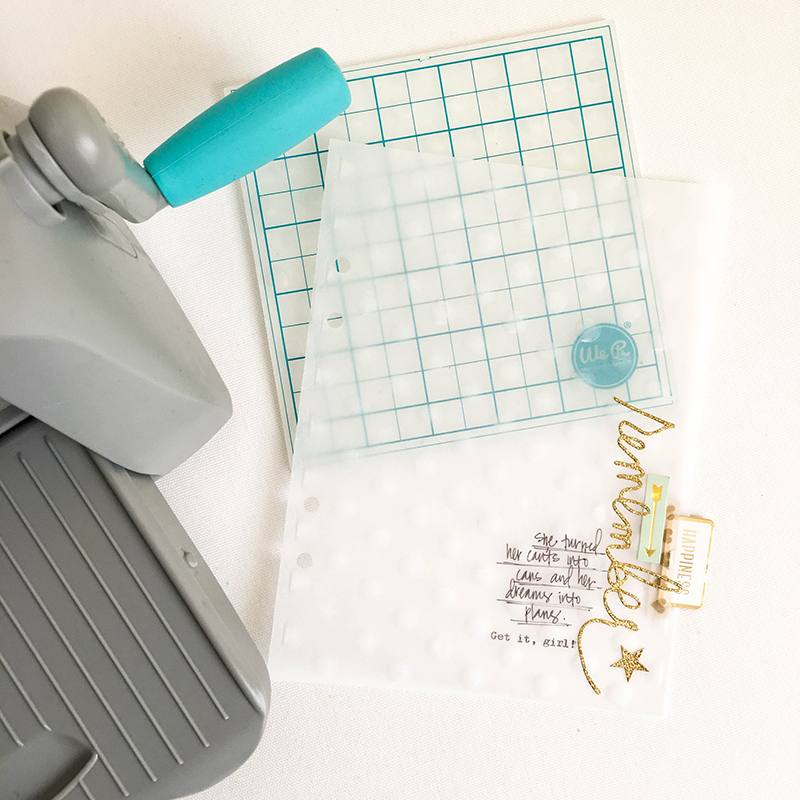 Because the embossing folder is only 6×6 inches, I had to adjust the position of my vellum and run it through a second time. 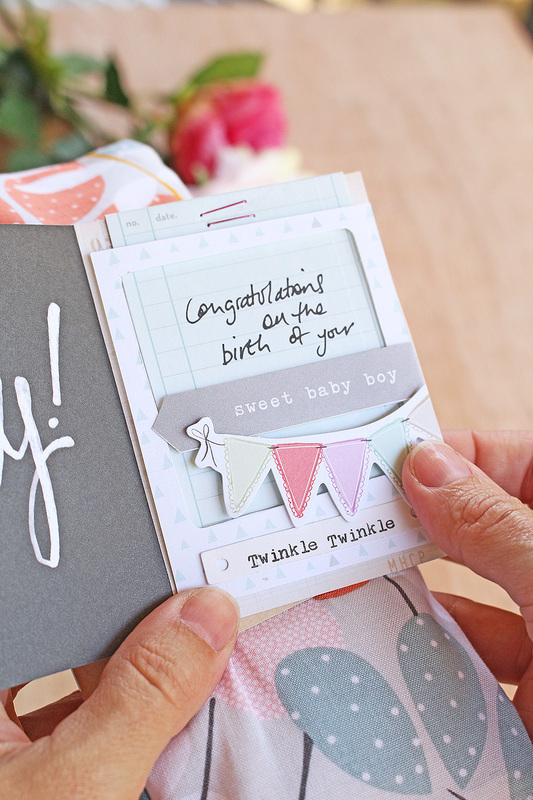 However, it was really easy to match up the design and you can’t even tell that it wasn’t embossed in one pass. 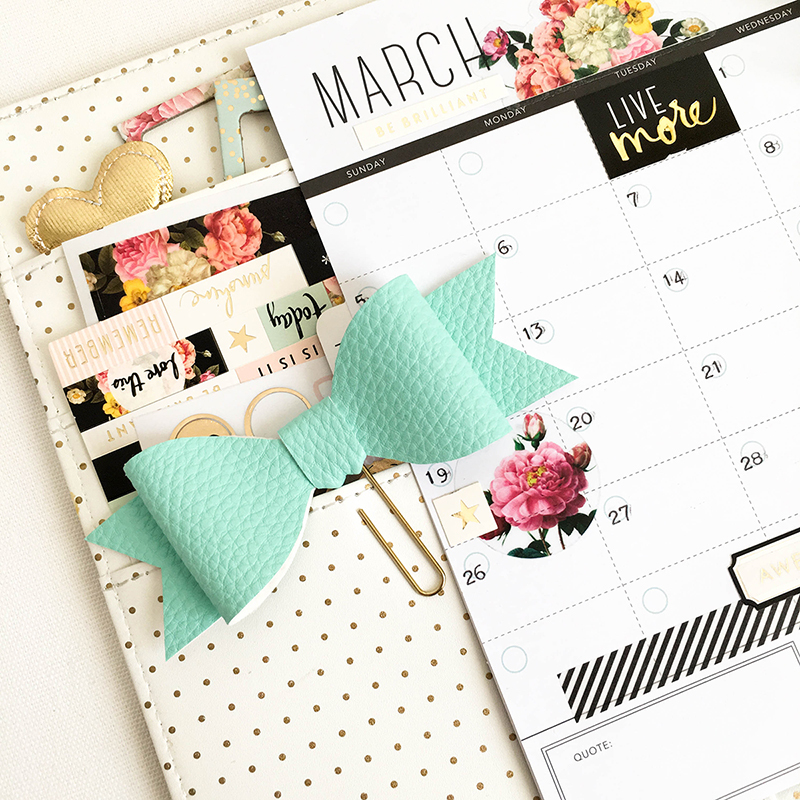 Next, I created a planner clip with the bow die. The die is intended to be used with paper, so this faux leather is a little more than it can handle. 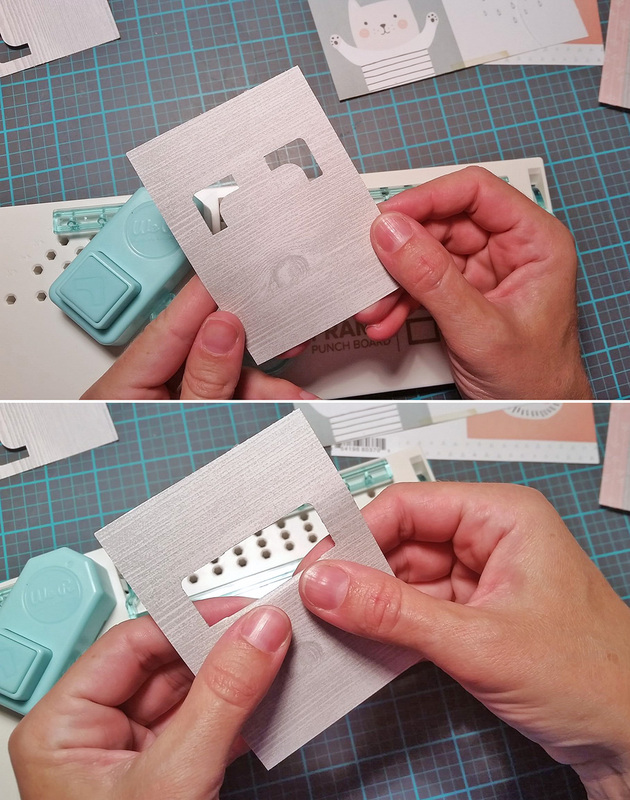 However, by running it through the Evolution Advanced, the die made a slight cut/impression on the pleather that I was able to use as a guide for my scissors. 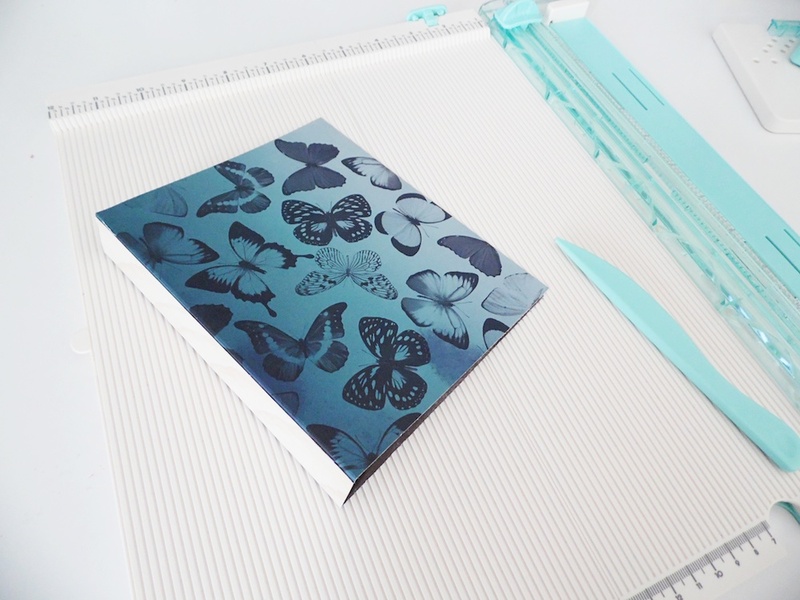 If you don’t want to run your die through with a thicker material, you could also cut a paper “template” and use it as a pattern on your pleather. 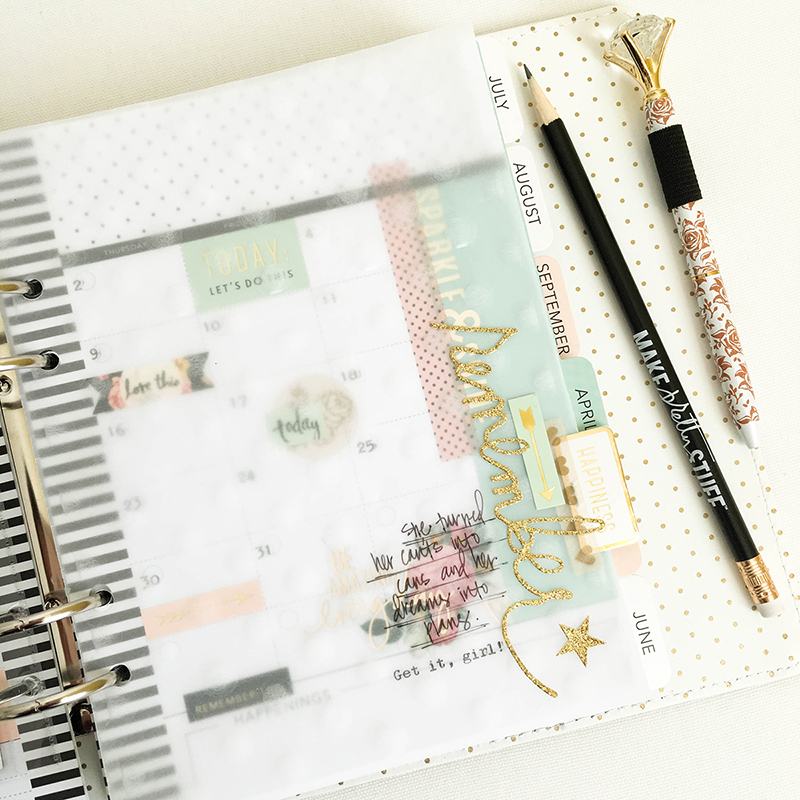 I love it when I can personalize my planner with such a helpful, easy to use tool. 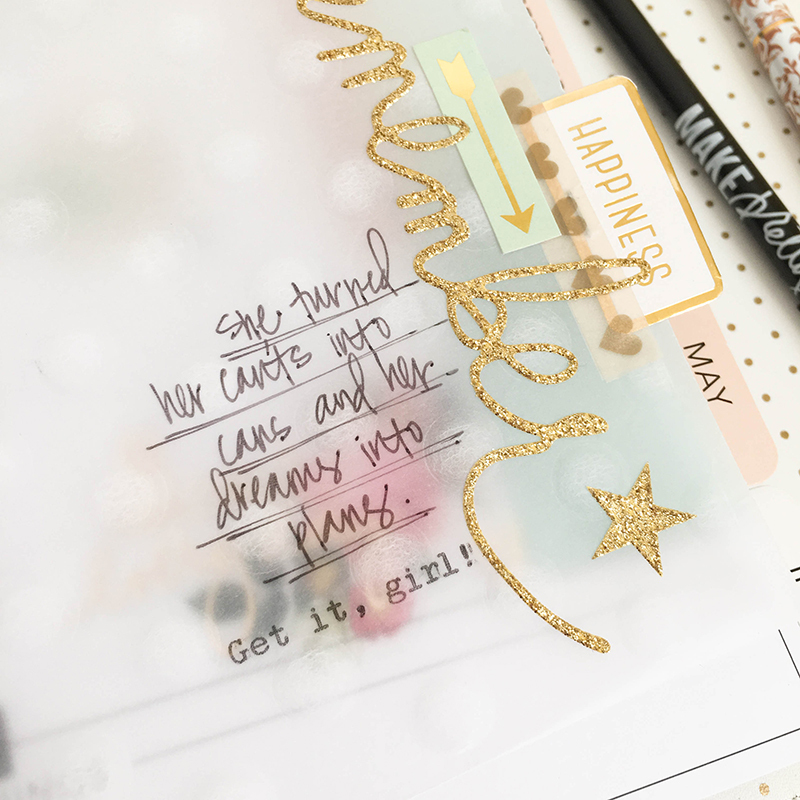 And speaking of handy planner tools, did you notice that I used the Typecast typewriter to date my pages and add a little message on my vellum divider? I love using my typewriter in my planner. So easy and such a great look! 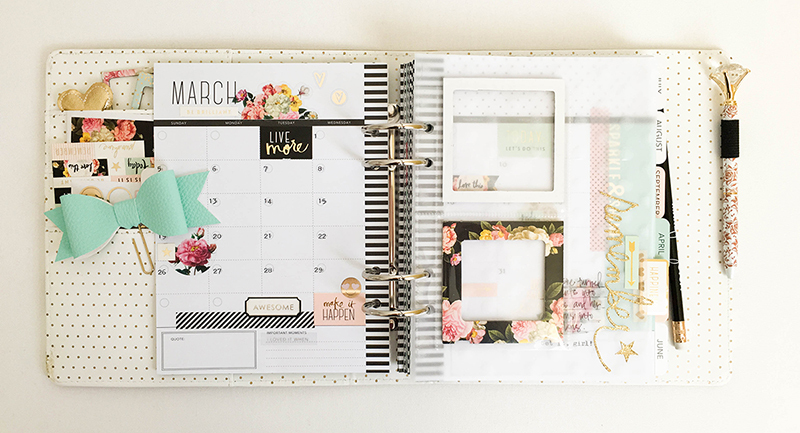 If you’re a planner girl, don’t forget about your Evolution Advanced, dies and embossing folders. 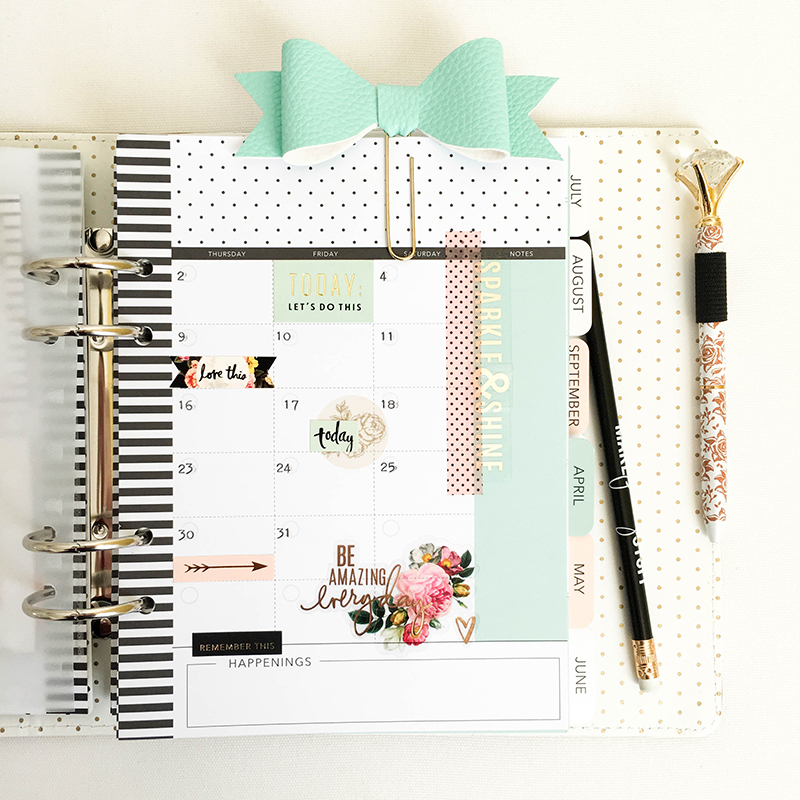 Your planner will love the extra special touches you can add. Happy creating! 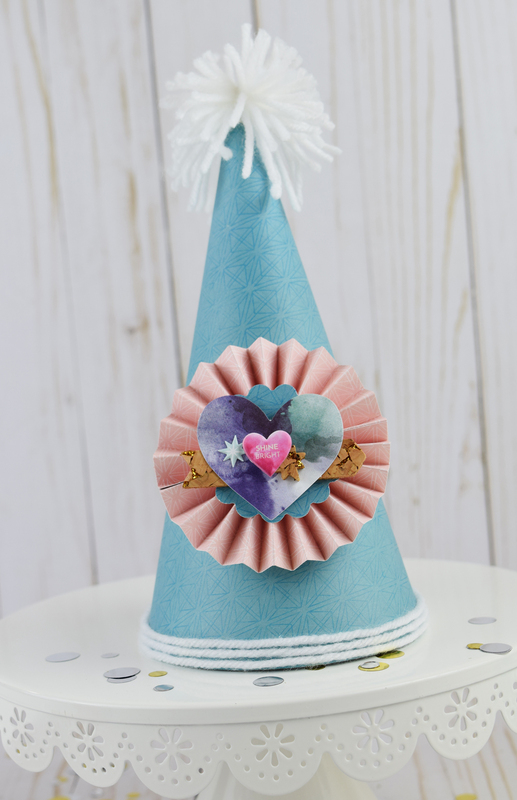 National Craft Month Kick-Off + Giveaway! Hello We R fans, and Happy Monday! Did you know that March is National Craft Month? We are so excited to celebrate this amazing hobby of ours that we’re going to party all month long, and we want YOU to join us! 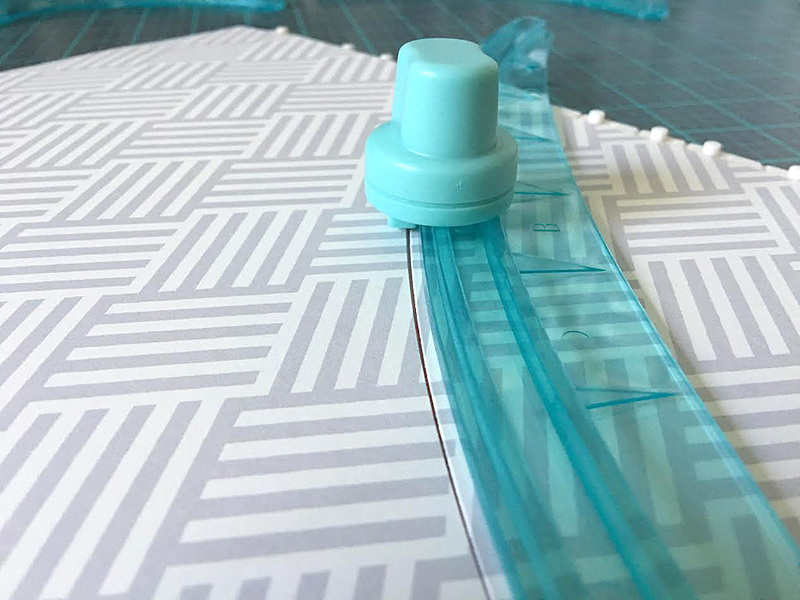 Each week, until the end of March, we’ll be featuring one of our popular crafting tools along with some project inspiration from our design team. 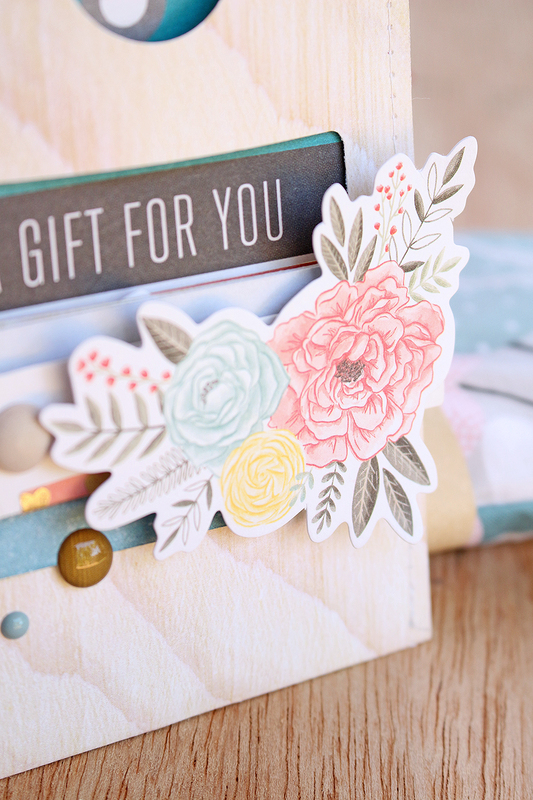 Each Monday we’ll announce our featured tool and host a GIVEAWAY! Each Friday in March we’ll announce the giveaway winner, so be sure to enter and check back to see if you’ve won. 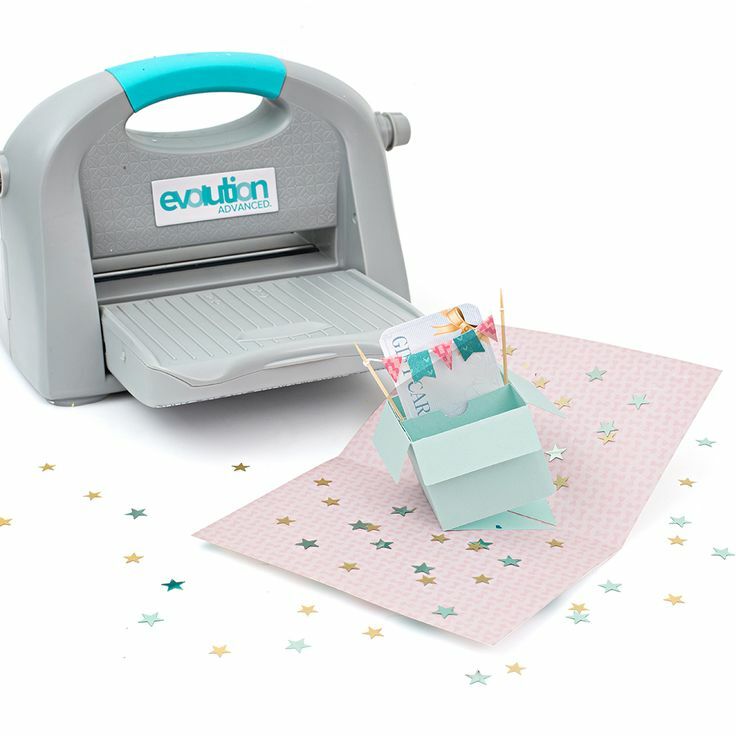 Our first featured tool is a very versatile one, our Evolution Advanced! 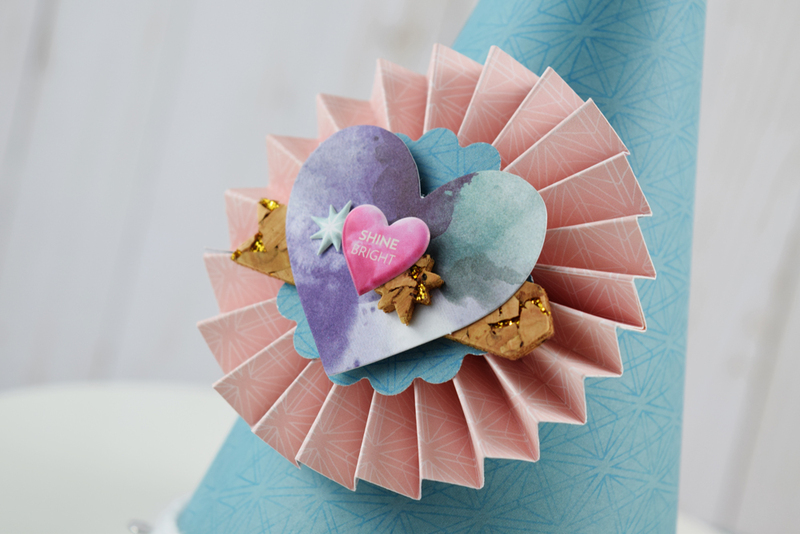 Die cut tons of shapes, 3D projects and embellishments; add depth and texture with embossing folders; or create beautiful letterpress projects with this universal crafting tool. Easily adjust roller pressure with the turn of a dial. 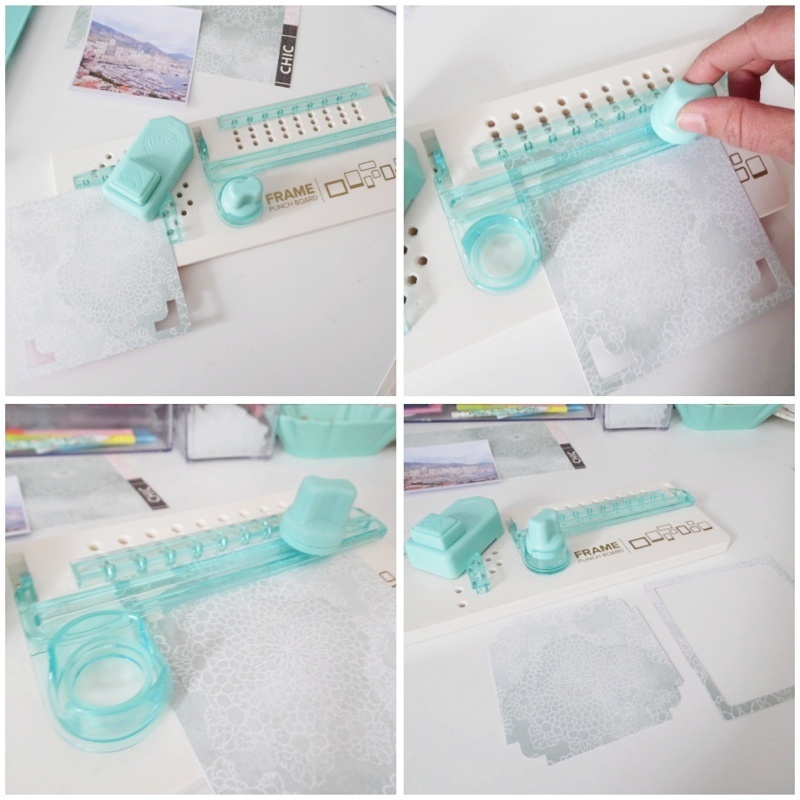 No more guesswork with different plates and shims! 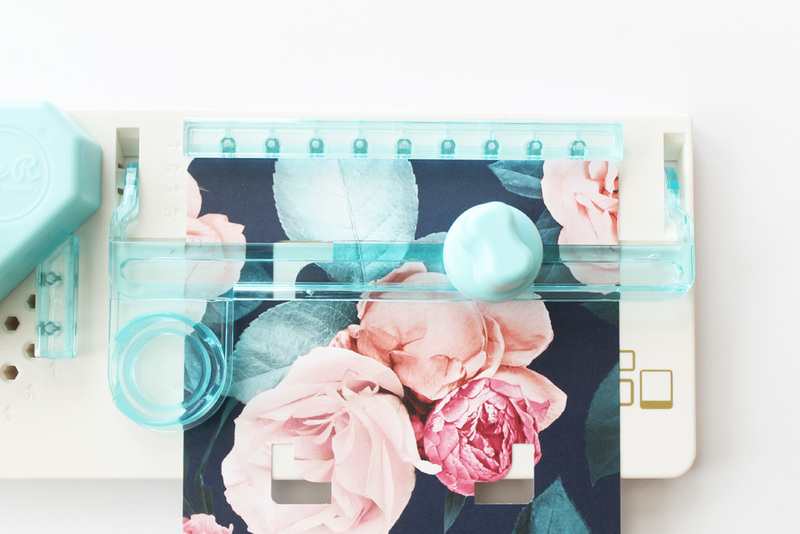 Store your dies and the removable handle in the platform storage containers, which also fold up for easy storage. 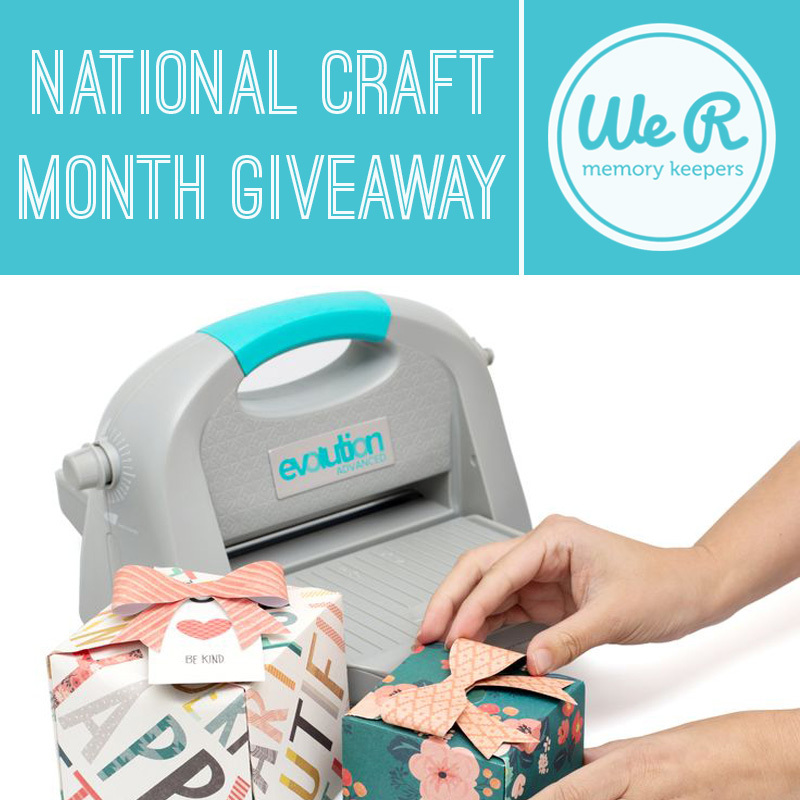 Our National Craft Month Kickoff Giveaway includes the Evolution Advanced, the Evolution Magnetic Mat B, and the Evolution Platform. 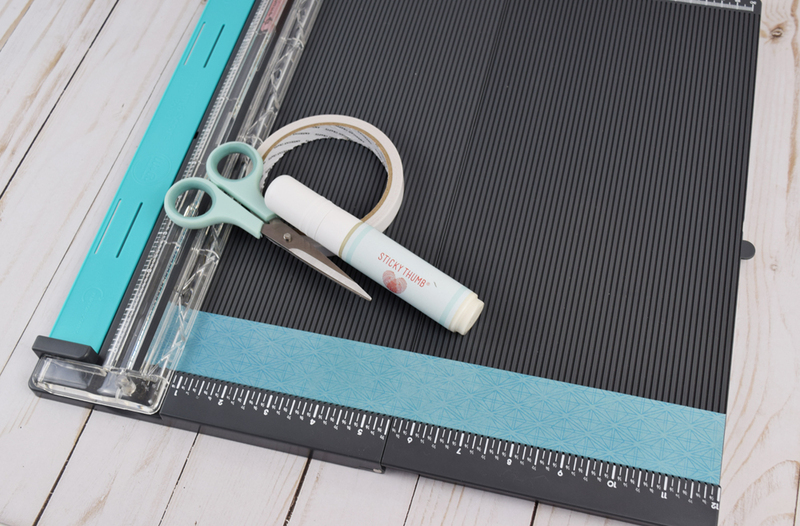 If you’d like to be considered for this giveaway, please leave a comment below telling us what kind of projects you would make with this tool. Comments will remain open until Thursday, March 2nd at midnight. 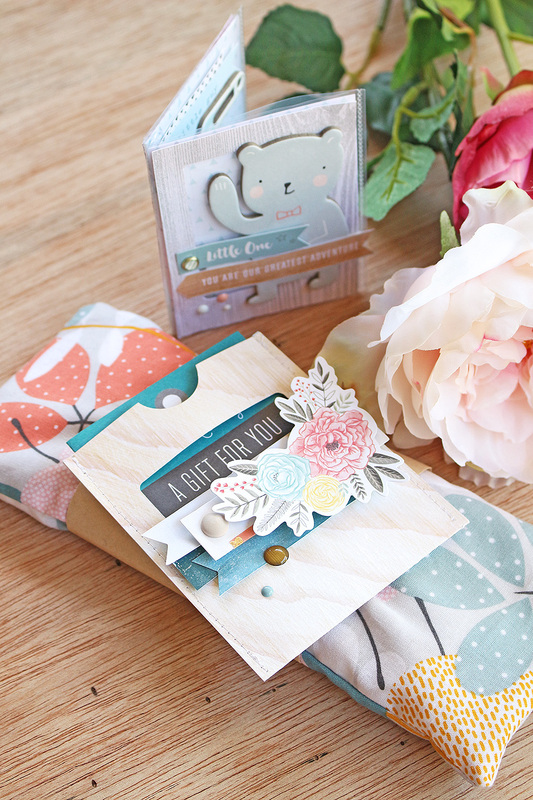 A random winner will be announced here on the blog on Friday morning. Good luck, and please remember to check back to see if you won! 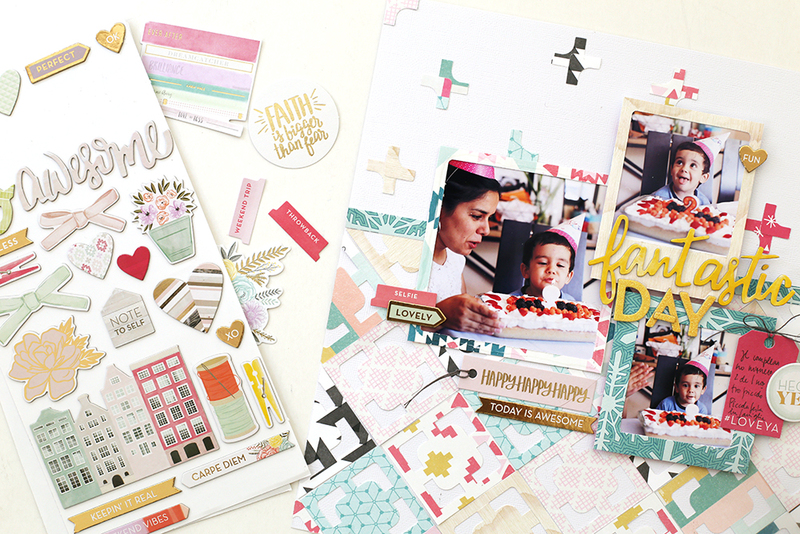 Be sure to come by often this week to check out some fabulous inspiration from our design team! Hello it’s Chantalle with you today. I am very excited for not one, but two friends who are due to give birth in the next few months. These two women also happen to be sisters! 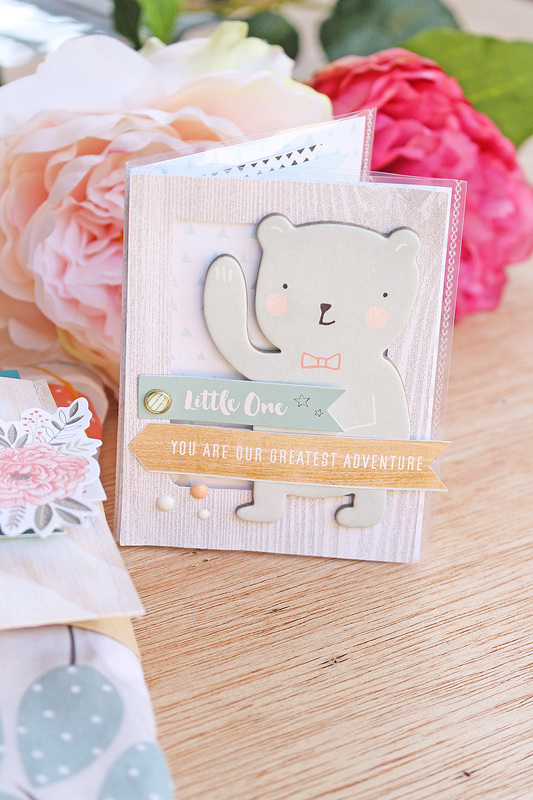 One sister is keeping it a surprise, while the other sister has found out she will be having a little boy – Yay! 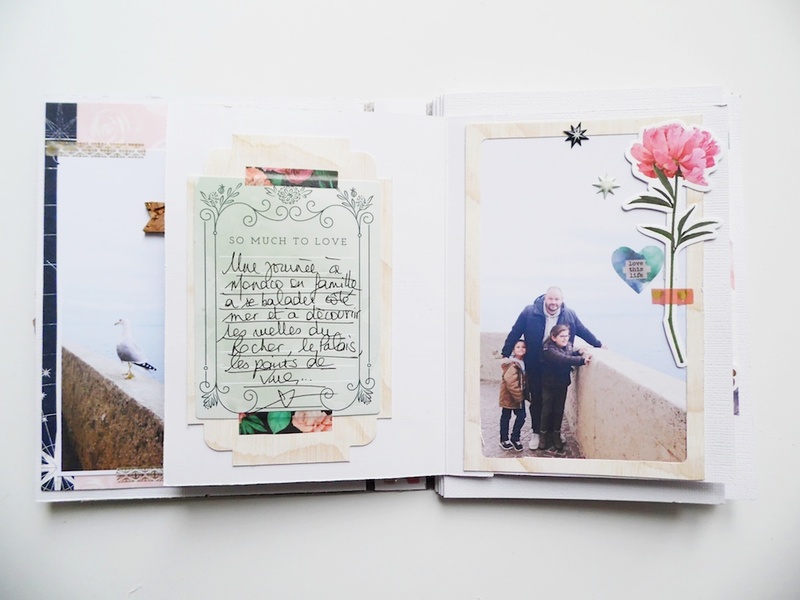 For this sister, I have created a little keepsake album and card, ready for the big day, using my Frame Punch Board. 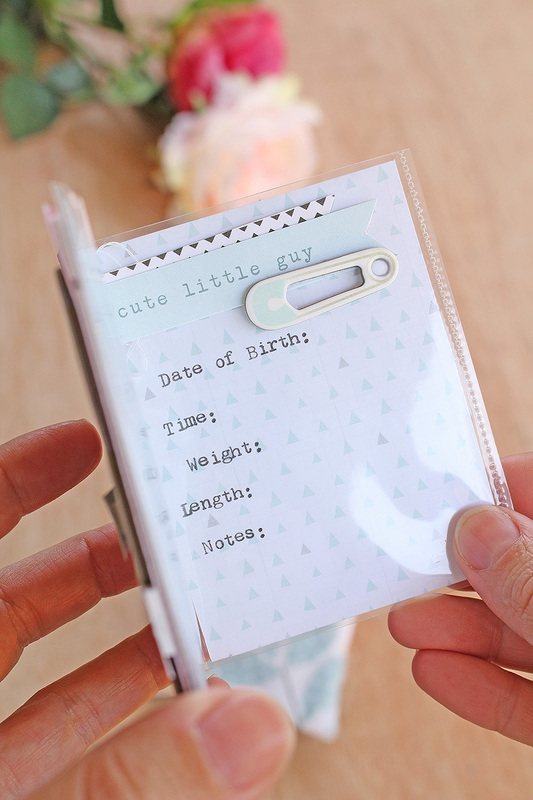 … along with a teensy birth record album she can use to jot down those all-important details and measurements! Both of these projects were completed with the help of my Frame Punch Board. 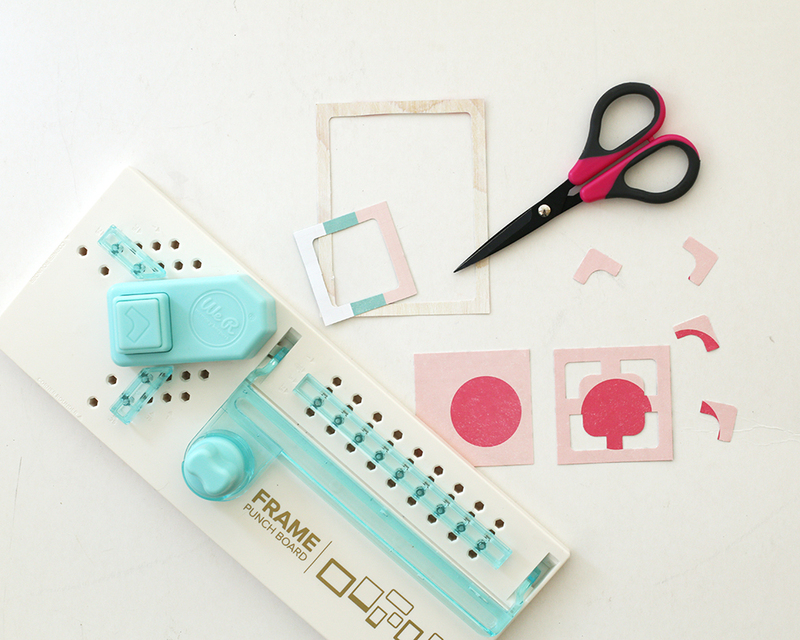 This is such a versatile tool – allowing you to create any size frame in a snap! My little album is 3×4” size, so for my front and back covers, I’ve used a 3×4” piece of paper, cut from a sheet of Pink Paislee ‘Arrow Avenue’. I wanted the top half of the frame to have a thinner frame edge and the bottom part to be a bit thicker (like a polaroid frame) so I punched the top two guides using the alignment bars at 0.25 and then adjusted them to 0.75 for the bottom two guides. NOTE: Adjust the corresponding cut alignment bars to accommodate for the width of the frame edge. Here is a short video I made a while ago showing the tool. 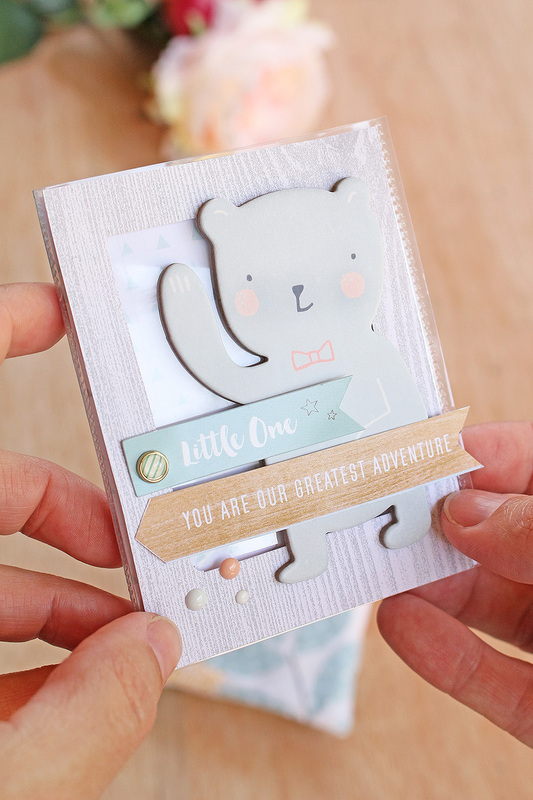 I adhered this frame onto the front of my album, along with some very cute embellishments from Crate’s ‘Little You’ collection. The album is simply a 4×6 Waterfall Fuse Sleeve which I have sealed in the middle with my Fuse Tool to create two 3×4 pockets. TIP: If you use your Fuse regularly, I highly recommend adding a Fuse mat to your stash. 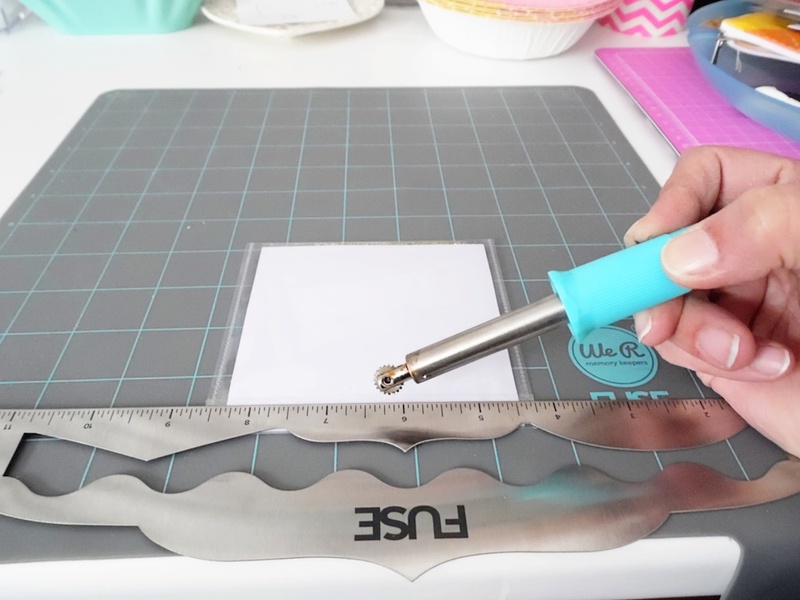 I find it much nicer to use than on a regular cutting mat surface. 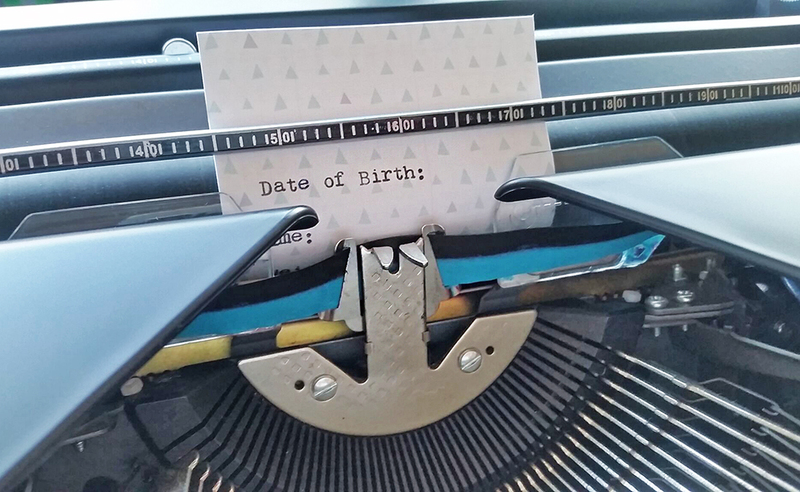 I fed this little 3×4” card straight into my Typecast Typewriter so I could type the headings directly onto it. 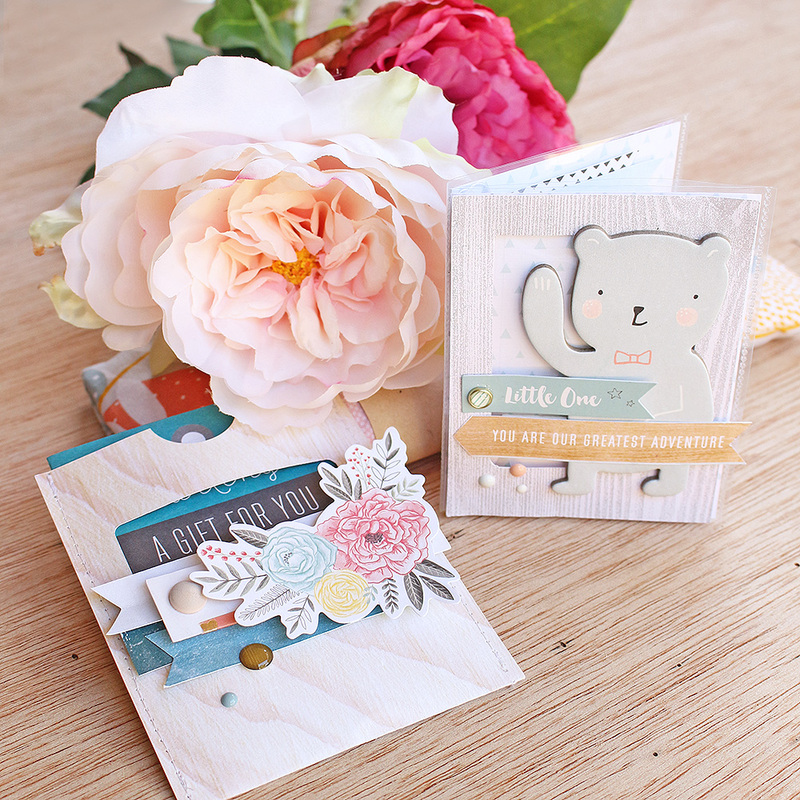 That little chipboard nappy pin is a fave! I wish I had added a few more bits from this collection to my stash actually – both the boy and girl versions are just adorable. I also really like how the typed font co-ordinates perfectly. 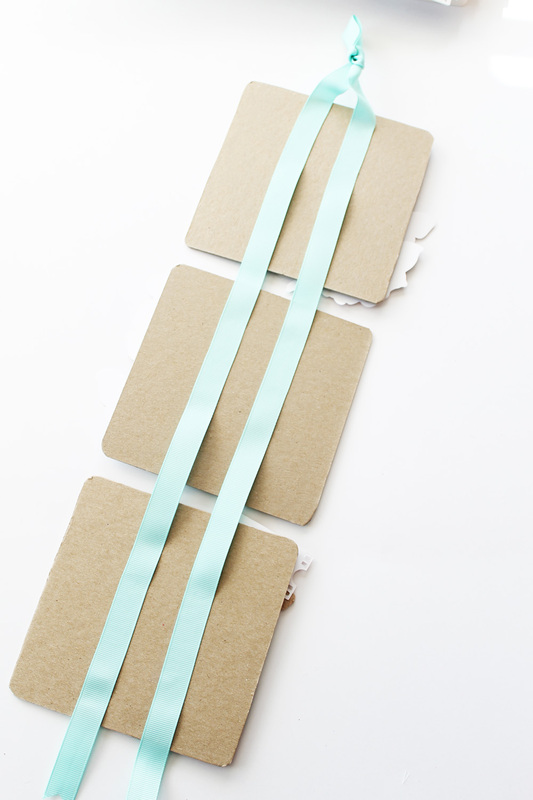 TIP: Grab a matching colour Typecast ribbon so your projects coordinate even more beautifully! For the back cover of this little mini, I have started out the same way as the previous frame, but instead of punching four guides, I have only punched two, with the alignment bar on position ‘1’. I then trimmed the section between the punched guides and folded the area down, adhering this section on the underside with runner tape. 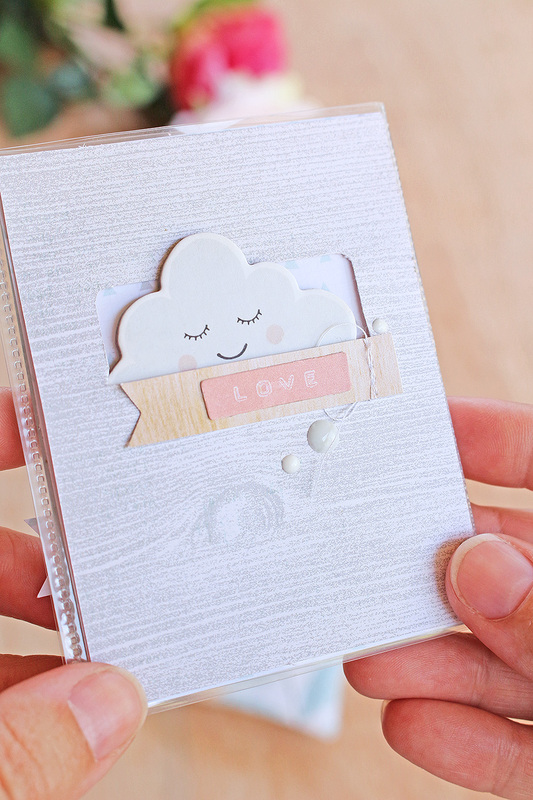 Inside this space, I’ve placed an adorable little chipboard cloud sticker with a few other little details like enamel dots and machine stitching. I love that peekaboo effect! 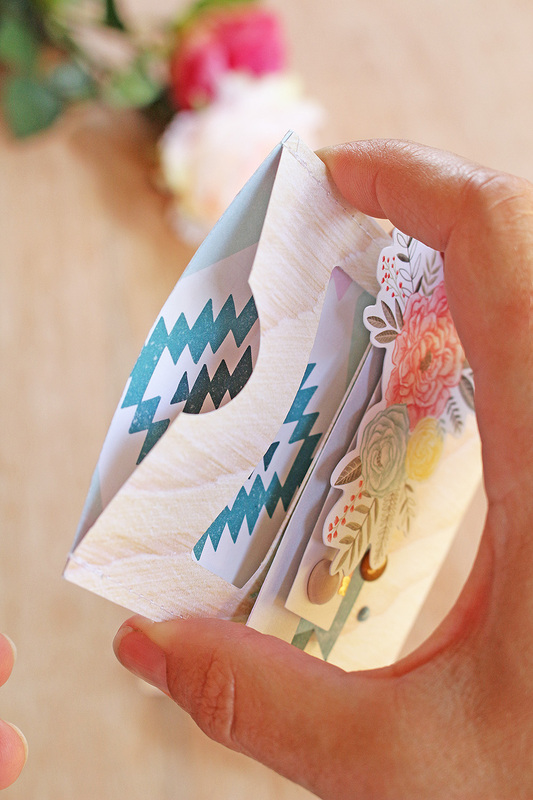 For Mum, I have a pull-out card inside a sleeve which works on the same principle as before. 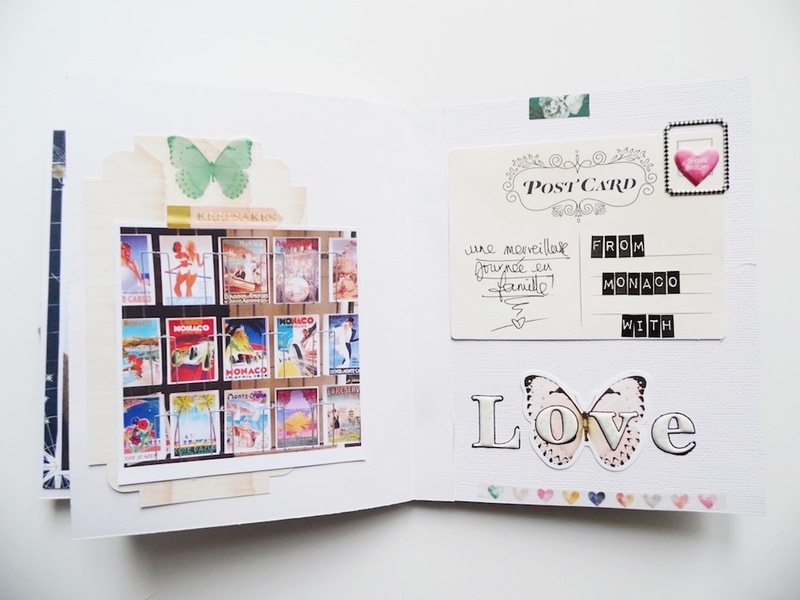 The card is a 4×6 journalling element from the Confetti collection by Crate Paper, which I have folded in half. 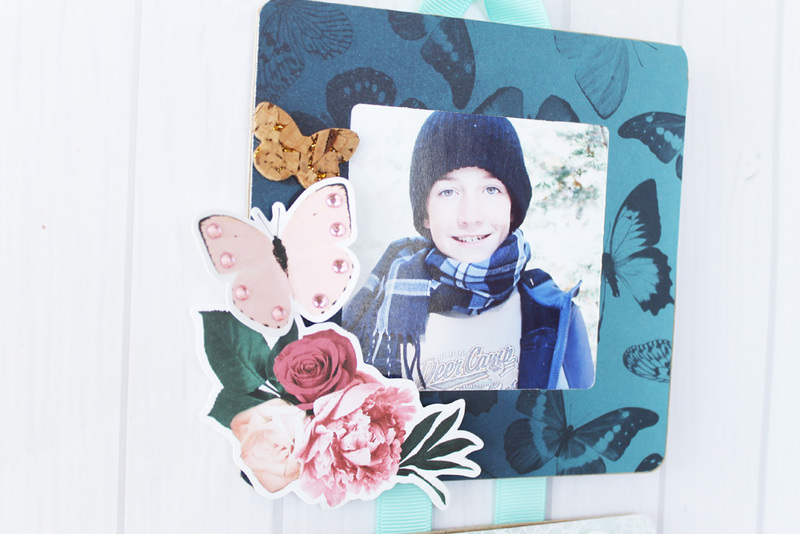 On the inside, I have attached a tag shape die cut with my Staple Board, another frame (which I created with the Frame Punch Board) and some other little details. ‘Twinkle Twinkle’ was typed up onto some little Typecast tags. 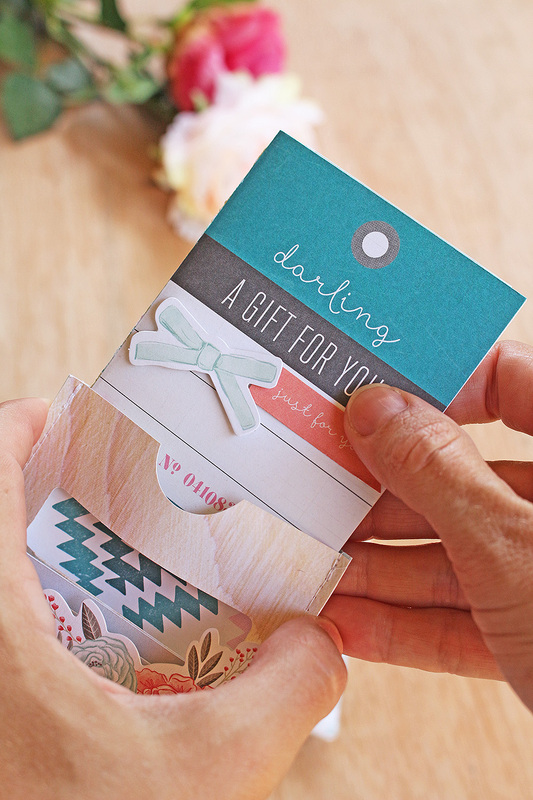 The card slides into it’s own decorative sleeve. This was created exactly the same as the back of the mini album above. I punched two guides instead of four and folded the bit inside before adhering. 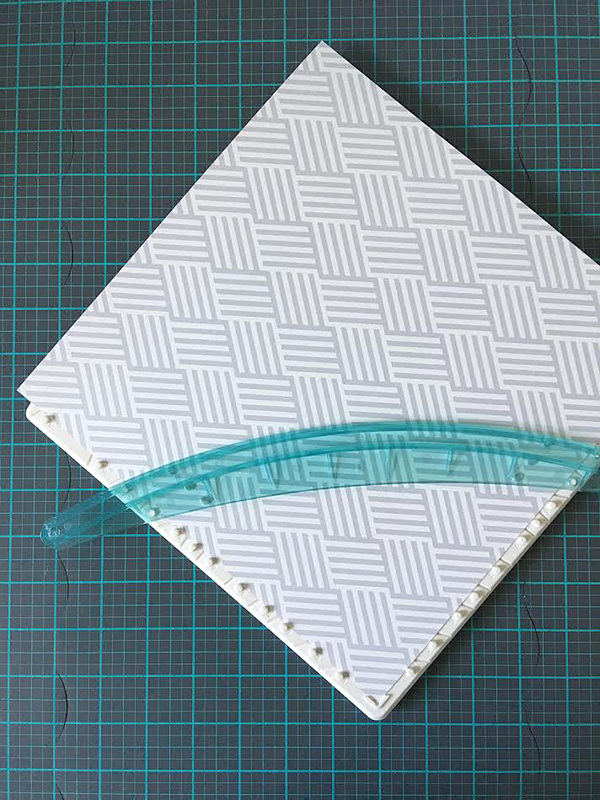 You can sew two pieces of 3×4’ card together to make the sleeve, or, as I have done here, make the piece of paper double the length and then simply fold in half before sewing. I prefer to sew sleeves shut if I can, as sometimes items inside get caught on sticky surfaces if the edges are sealed with double sided tape. 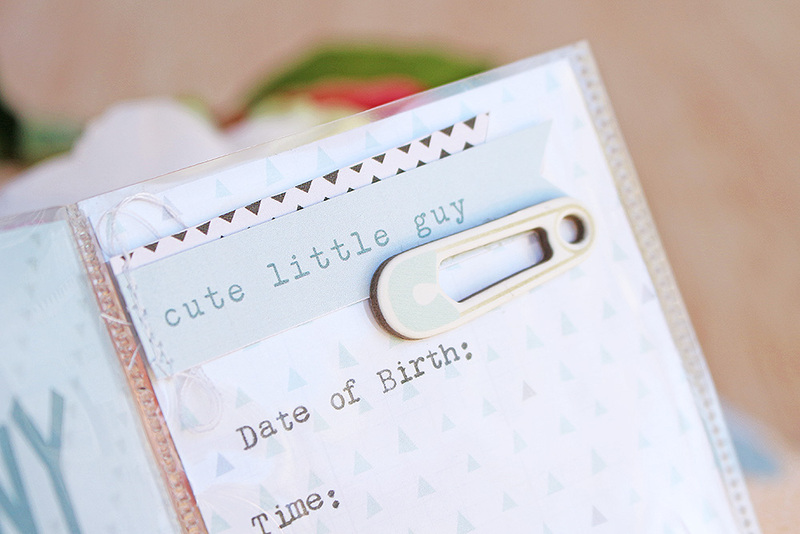 As ever, these ideas could be tailored to suit a number of occasions. Thank you for joining me today. Happy creating! Hello WRMK fans! 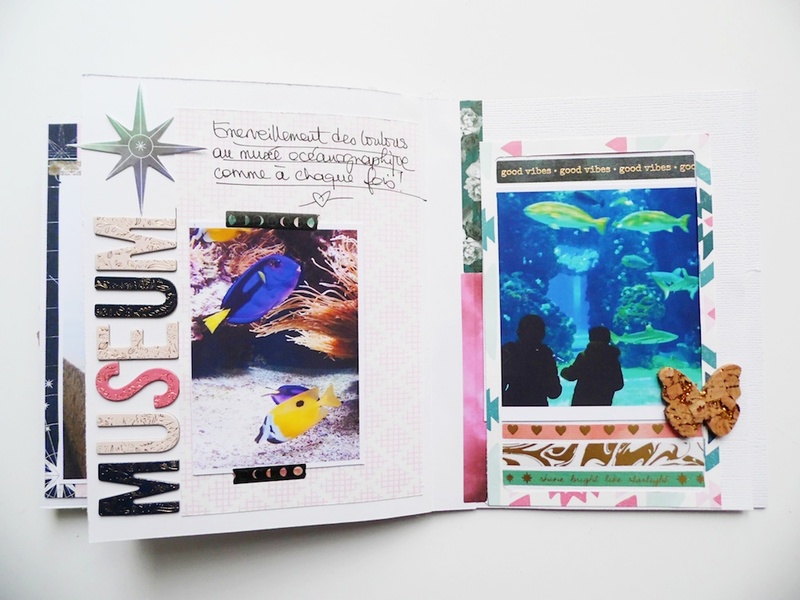 Soraya here with you today to share a creative minibook I made using the fun-tastic Frame Punch Board ! 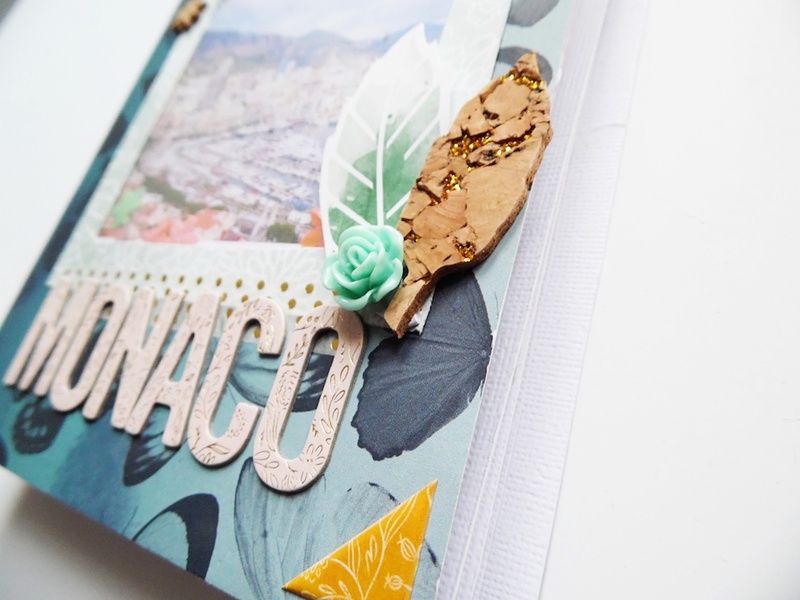 « Monaco » is the title of this minibook since living on the French Riviera I have the chance to go there often and last time we spent the day in Monaco, we had a fabulous moment walking in the old city near the Princely Palace, admiring the amazing panoramic view above the Mediterranean Sea and visiting the great oceanographic museum. 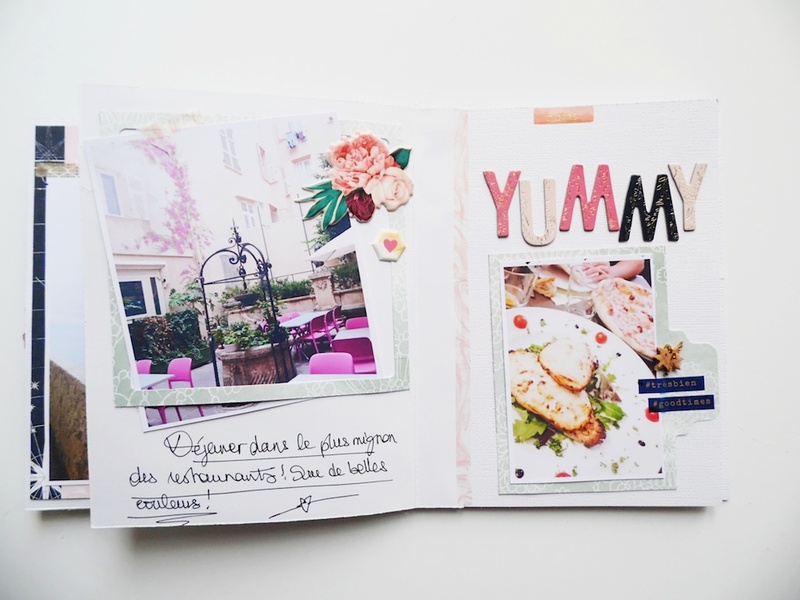 It was a perfect day to be documented in a minibook ! So I will take you with me on a trip to Monaco, are you ready ? Let’s go ! 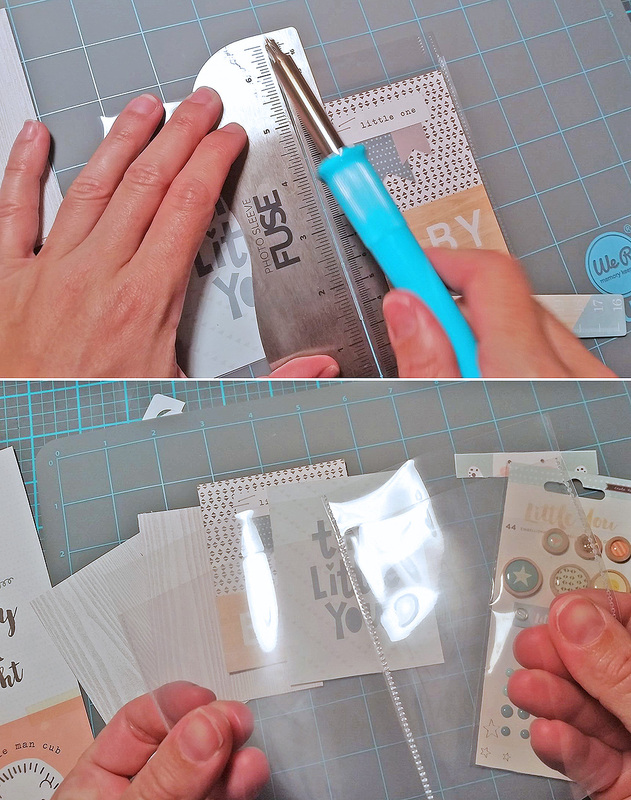 To create the inner pages (in various sizes) I scored a border at about 1 inch on every left edge : this is where they are going to be stuck on the cover. Let’s make a shaker pocket frame on the cover! 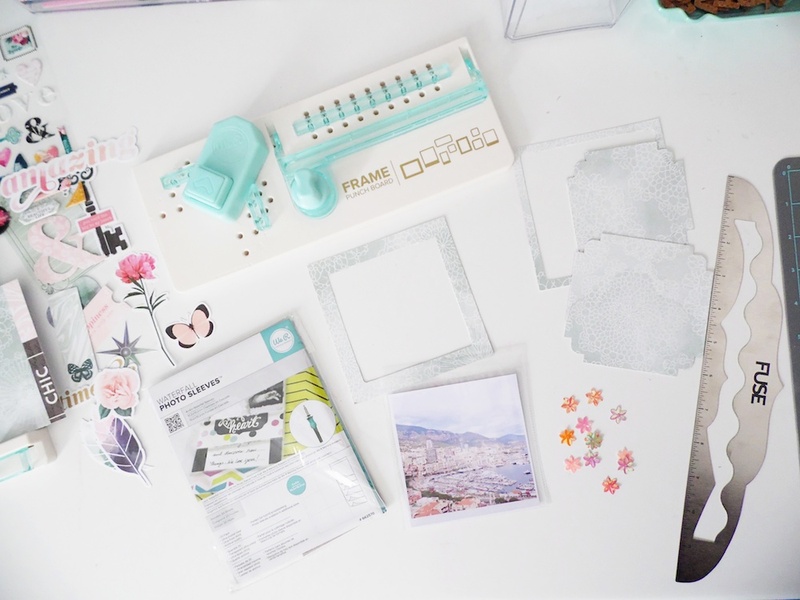 Grab your Frame Punch Board and trim a frame to fit the size of your photo. Follow the instructions in the manual, or follow the demo video you can find on the WRMK YouTube channel. 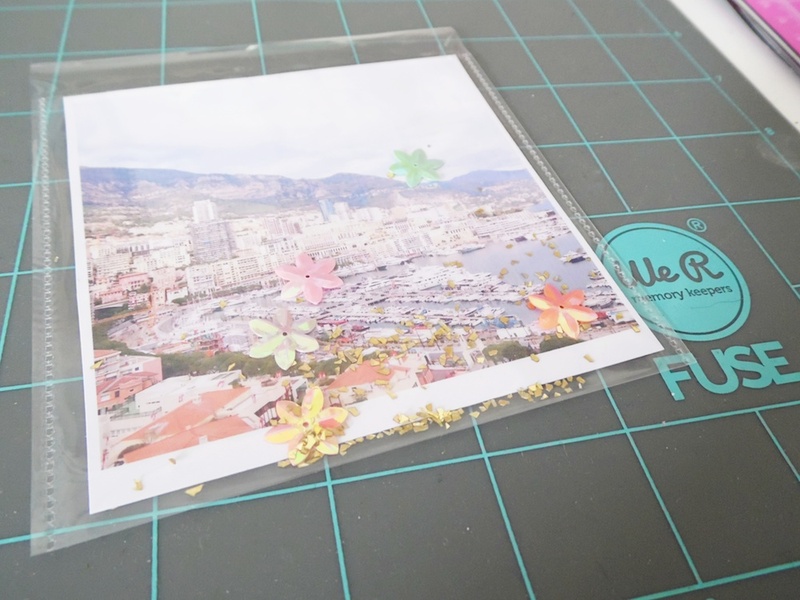 Once you’ve done the frame, put your photo into a waterfall photo sleeve, add some sequins and sparkles inside. Then, use your Fuse Tool on the Fuse Mat to close the pocket on the back. 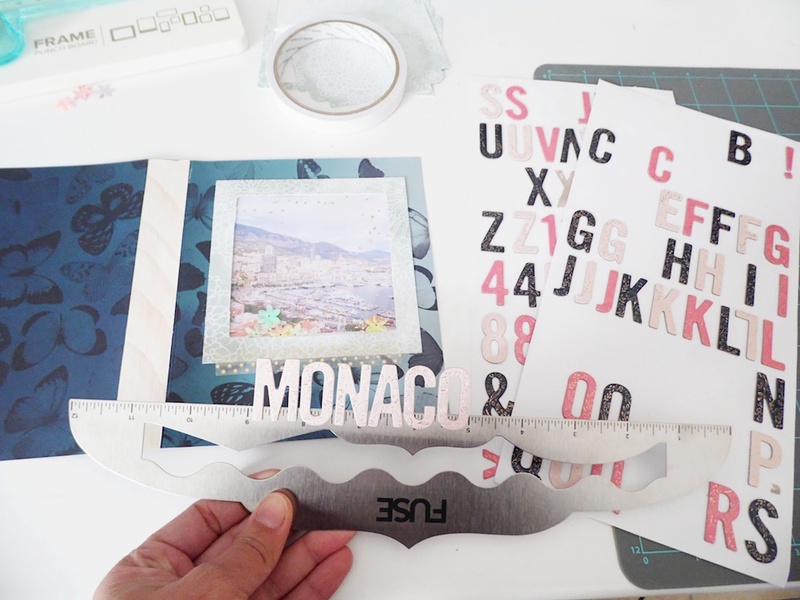 Here is a tip to place your title : use a ruler to set your thickers on it before placing them on your project! 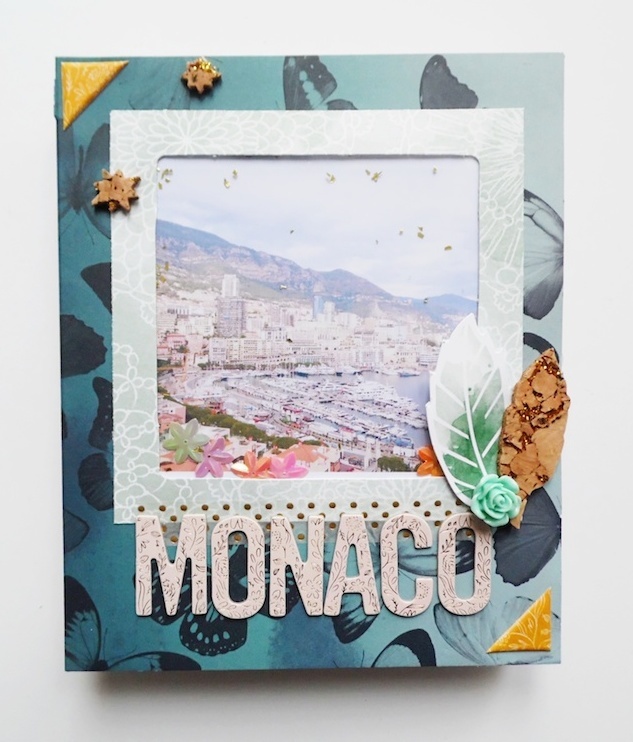 Add some embellishments all around the frame and voilà! Love the touch of glitter on the photo ! 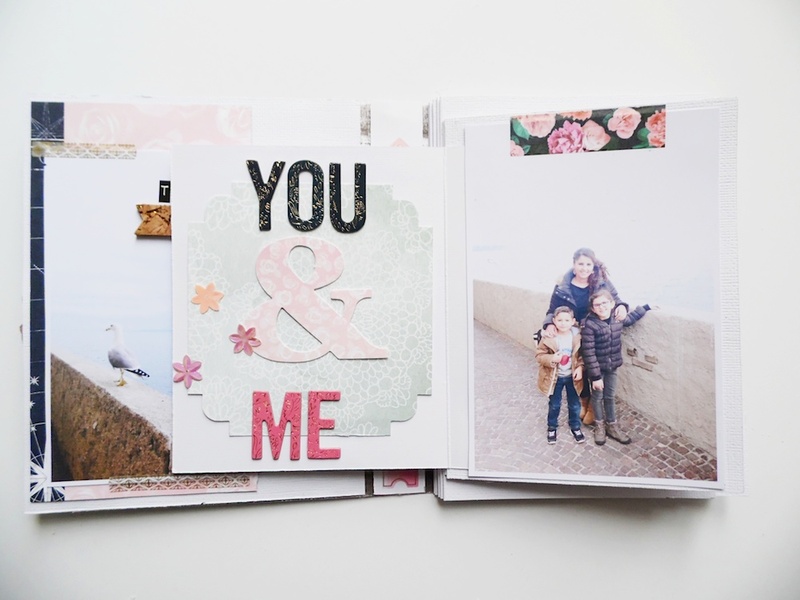 Let’s go through the minibook and see how I used the Frame Punch Board to showcase the photos ! 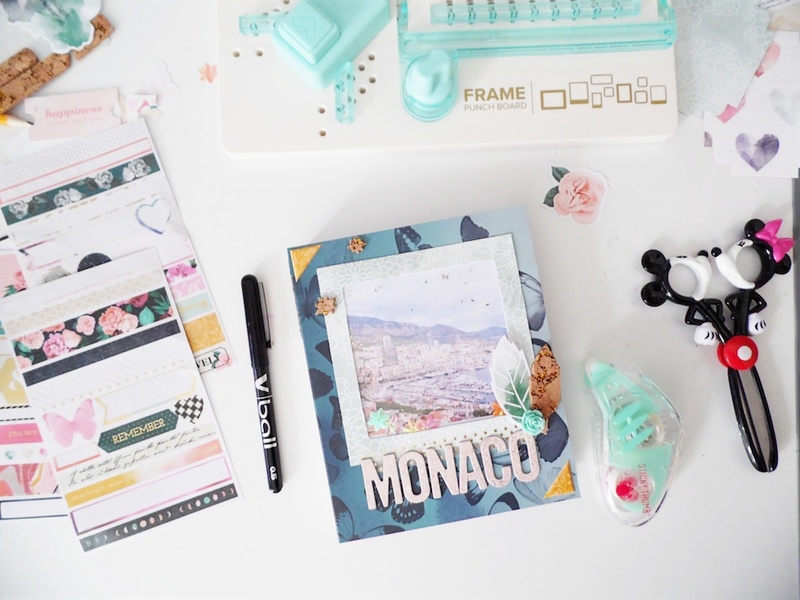 Here is another tip : you can use the « negatives » of the frames as labels to place under some titles and embellishments and even to mat some photos ! Thanks for joining me! 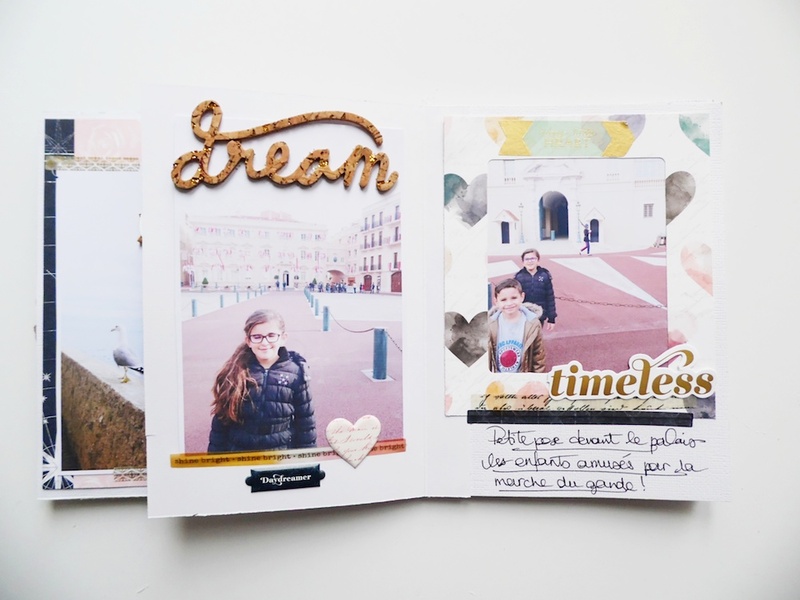 I hope this project will inspire you and will make you want to document your family moments, travels and special days in such a cute frame minibook ! 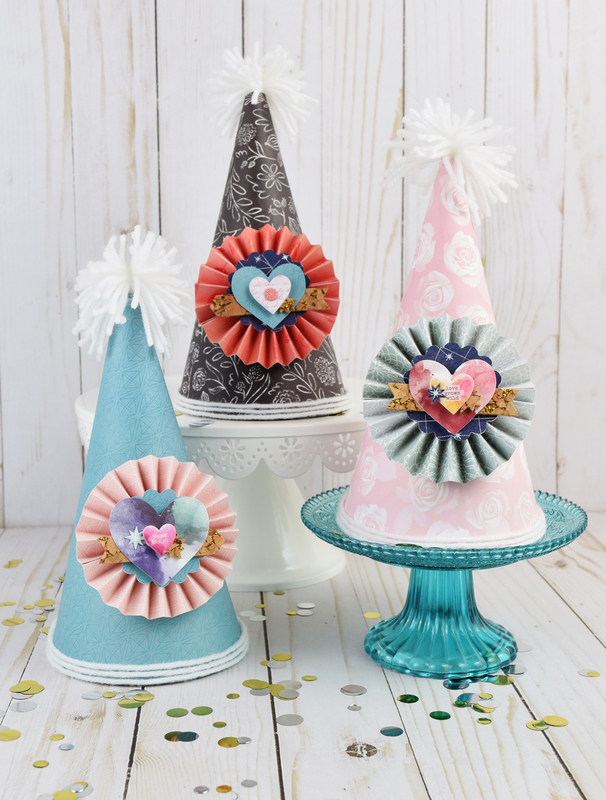 Have a wonderful crafty time everyone, until next time ! 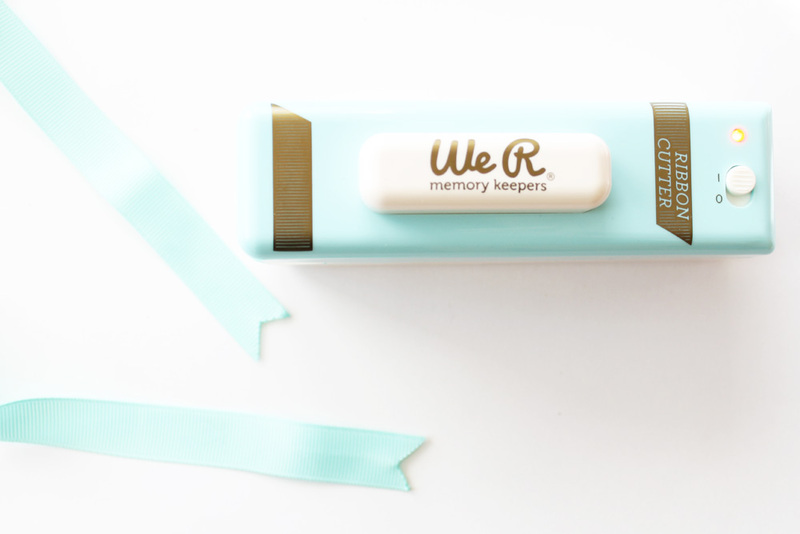 Good morning, We R Memory Keepers fans, Laura here. 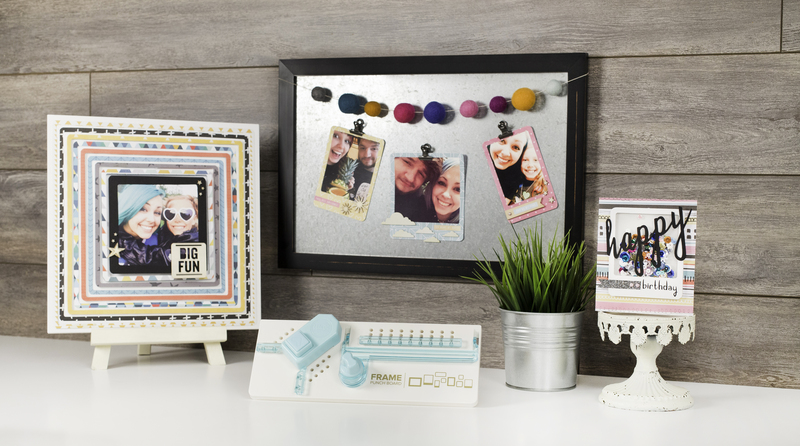 Today I am going to show you how easy it is to create a photo display you can hang on your wall using the frame punch board. 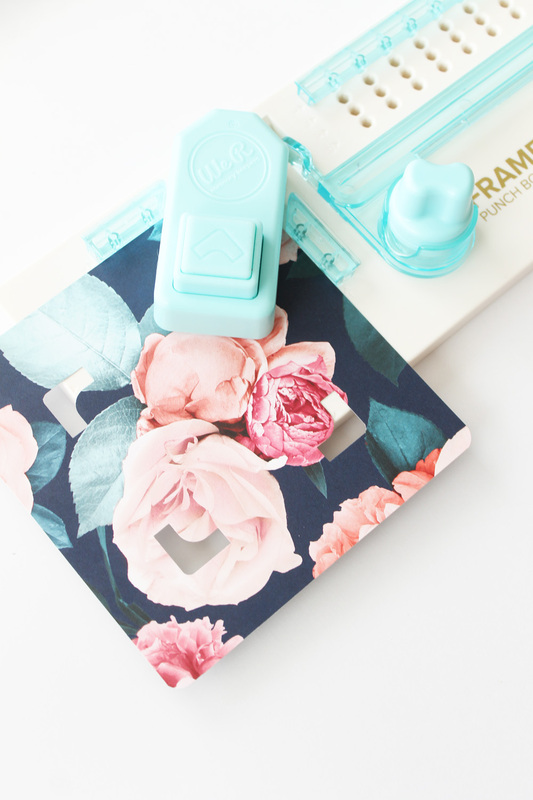 You can use any type of patterned paper or cardstock to match your home decor. I started by cutting three sheets of patterned cardstock from the Pink Paislee Moonstruck collection to 5 inches x 5 inches. I used the frame punch board to round the corners on each piece. 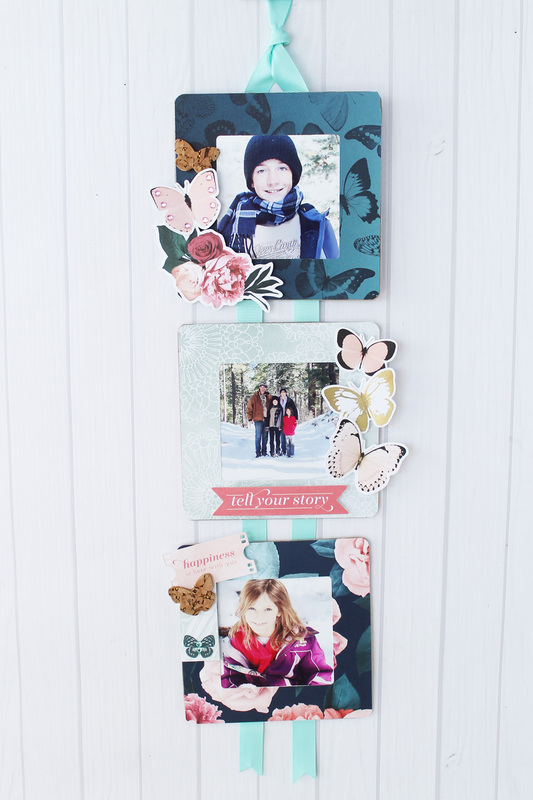 Move the guides on the frame punch board so you can create a one inch border frame. You will punch all four corners. 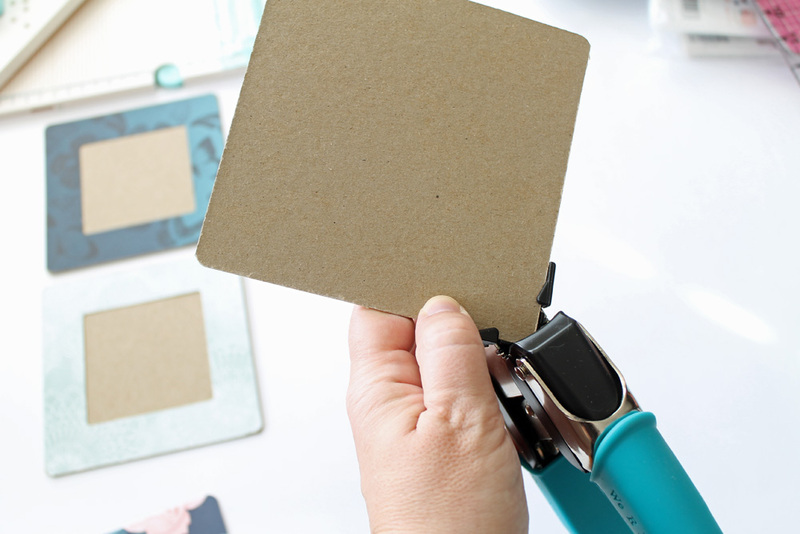 Then, set your cutting guide on the frame punch board to one inch as well. 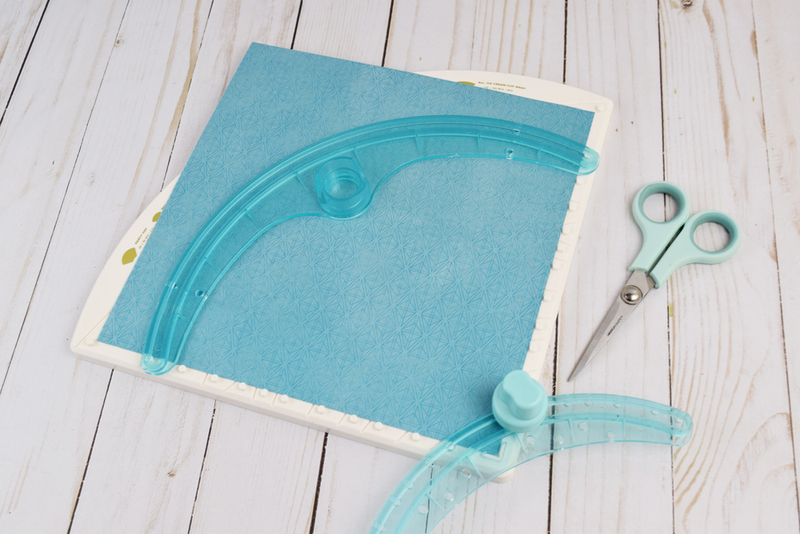 Trim all four sides of the paper to create a 5 inch square with a one inch border. Repeat this on all three patterned papers. I trimmed chipboard to 5 x 5 inches and rounded the edges using my corner chomper. 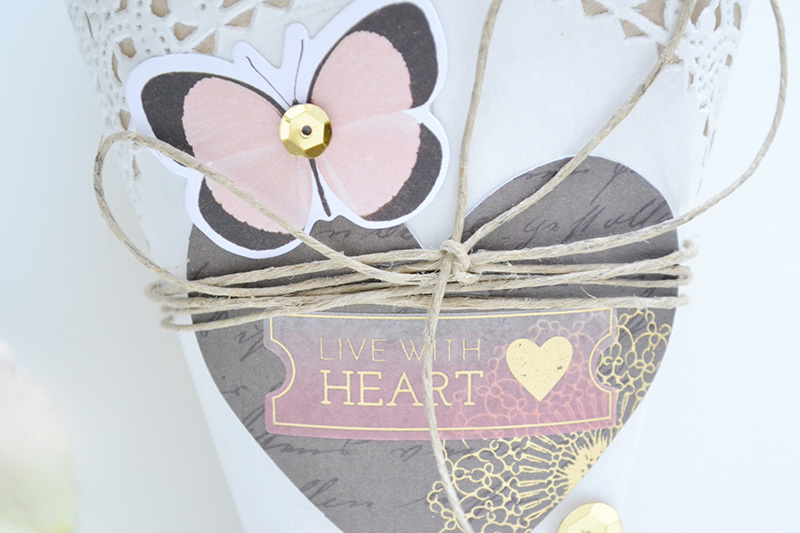 I attached the patterned paper to the chipboard on three sides using double sided adhesive. I left the top open so I can switch out the pictures later down the road. I printed out my photos on my home printer and trimmed them to fit inside each photo frame. 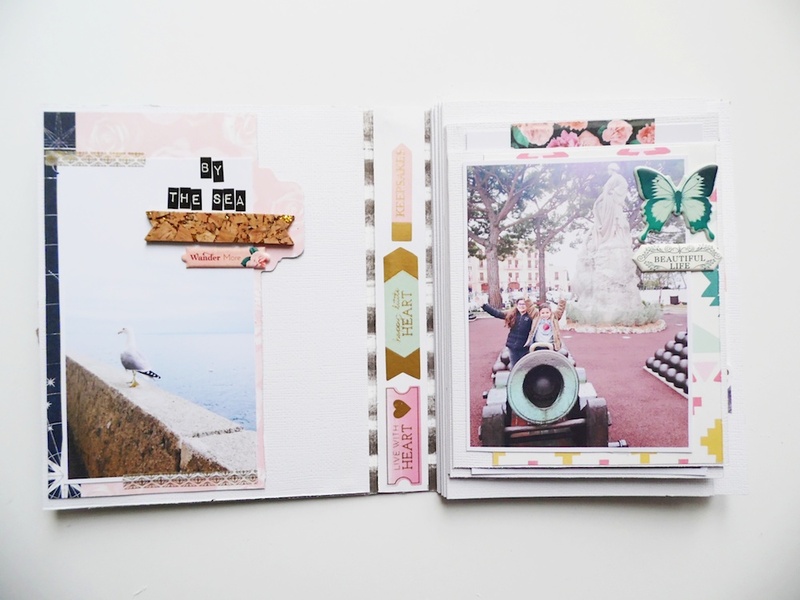 I embellished each frame using Moonstruck ephemera, cork stickers and gem stickers. To be able to hang the frames on the wall, I attached ribbon to the back. 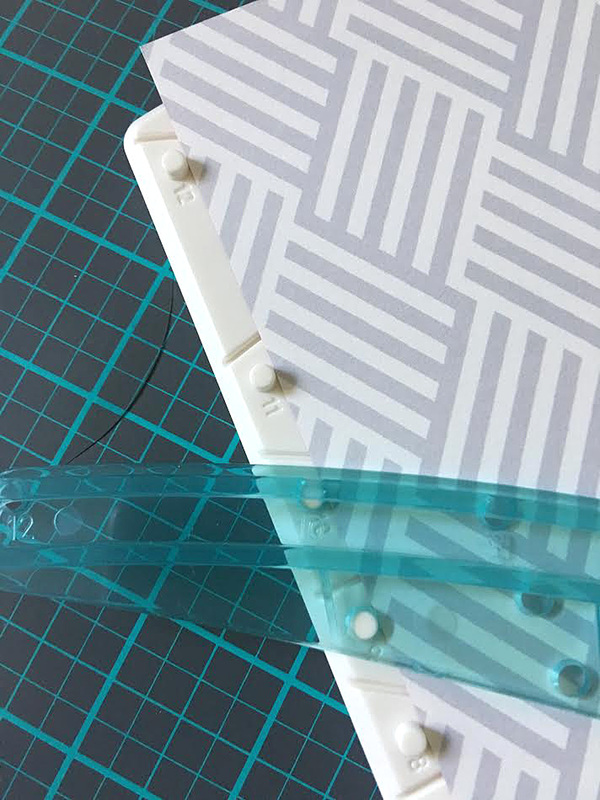 I sealed the ends of the ribbon with the ribbon cutter tool. I folded the ribbon in half and tied a knot to create a hanger. 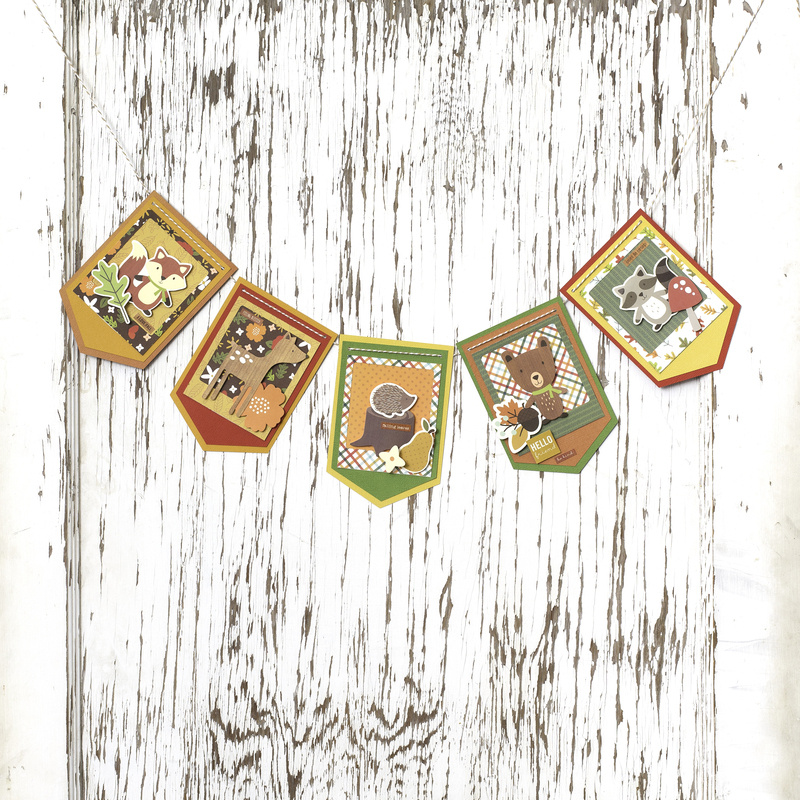 I then attached the two strips of ribbon along the back of the photo frames using double sided adhesive. I love that I can easily change out the photos as I want. 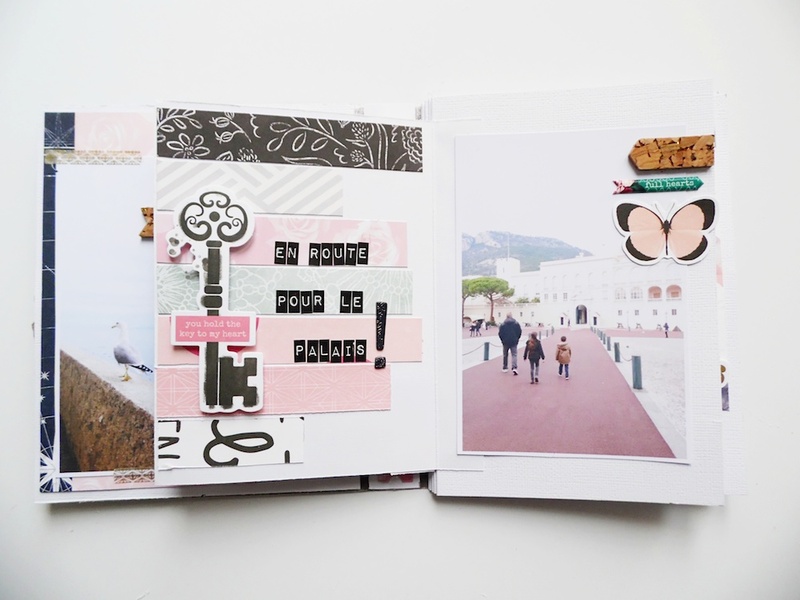 And the papers in this collection are so pretty. Those butterflies have got to be my favorite feature! Hi! Welcome to the We R blog! 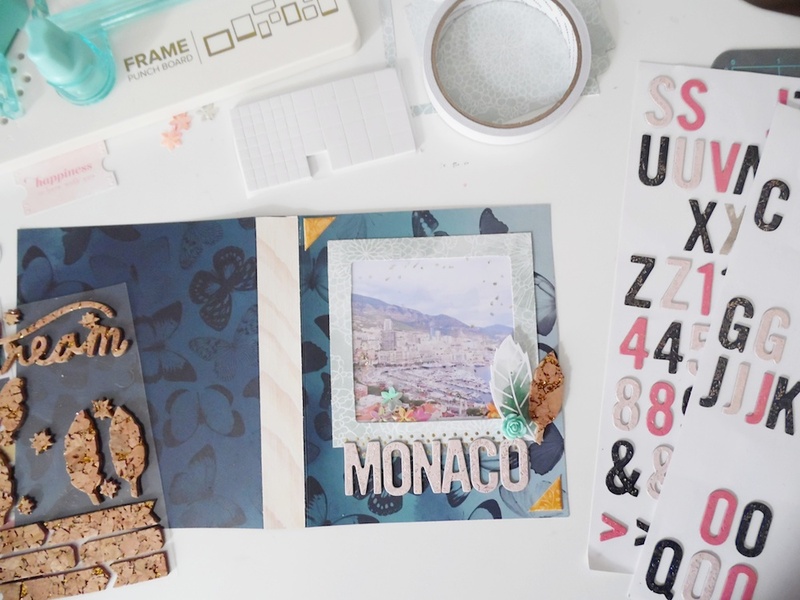 It’s Eva Pizarro here today sharing three ways you can use the Frame Punch Board for your next scrapbook project. When I began to use the Frame Punch Board I was immediately drawn by the beautiful shapes left by the board. 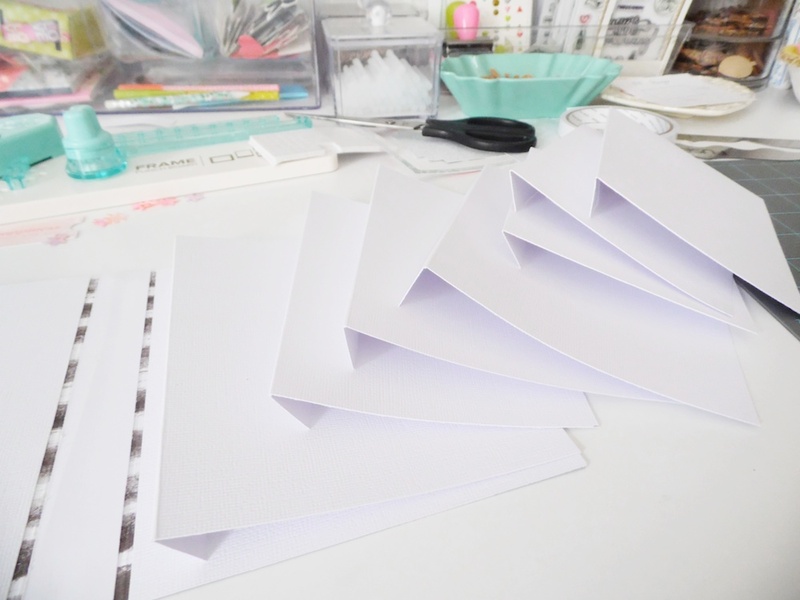 Those are meant to be scraps of paper but I thought I could use them in my layout. When you punch the four corners of your paper this is what you have left: a square with another shape in the center and 4 little pieces of paper. I used the squares as a background for my layout. I began with 2 ¼ inch squares and placed them diagonal. I cut some of the squares in half and filled all the spaces. 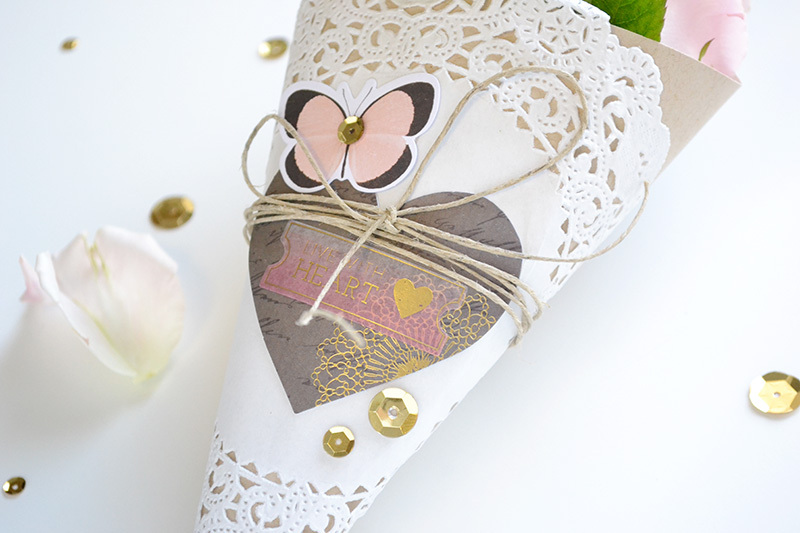 I also used those little scraps of paper to create the crosses on the upper part of my page. I think they would look awesome filling the entire page! Finally I used my Frame Punch Board to create different frame sizes. I did three styles: one thinner, one larger and a polaroid style frame. 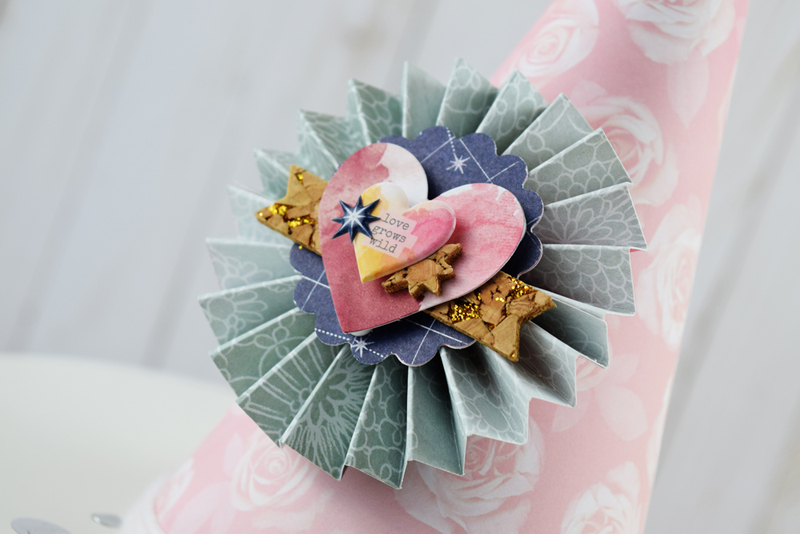 I used papers from the Snow and Cocoa Collection by Crate Paper and embellishments from the Take me Away line by Pink Paislee. To add a little more depth and make my frames stand out I used 3d dots on some pictures and embellishments. 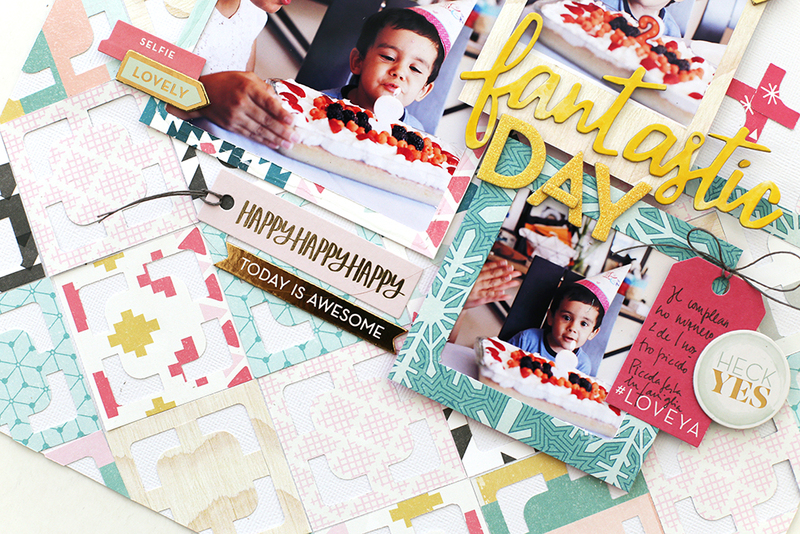 I love the quilt style background of my layout. 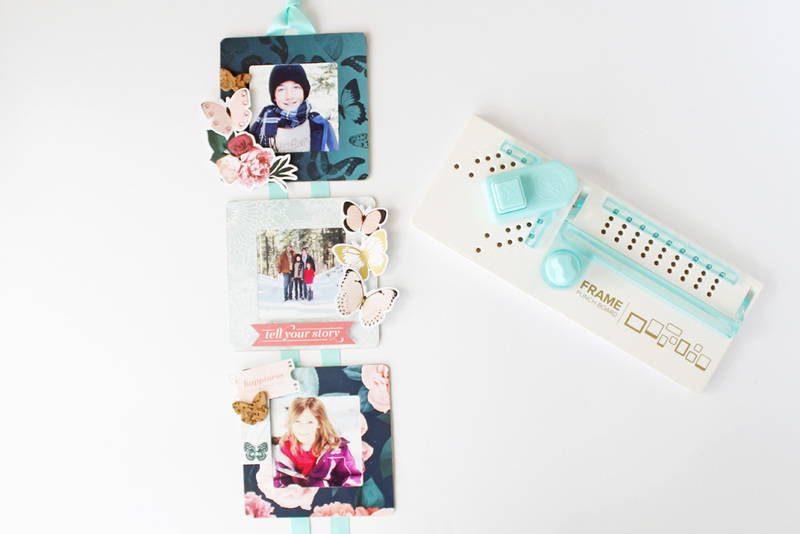 The Frame Punch Board is definitely a must have! 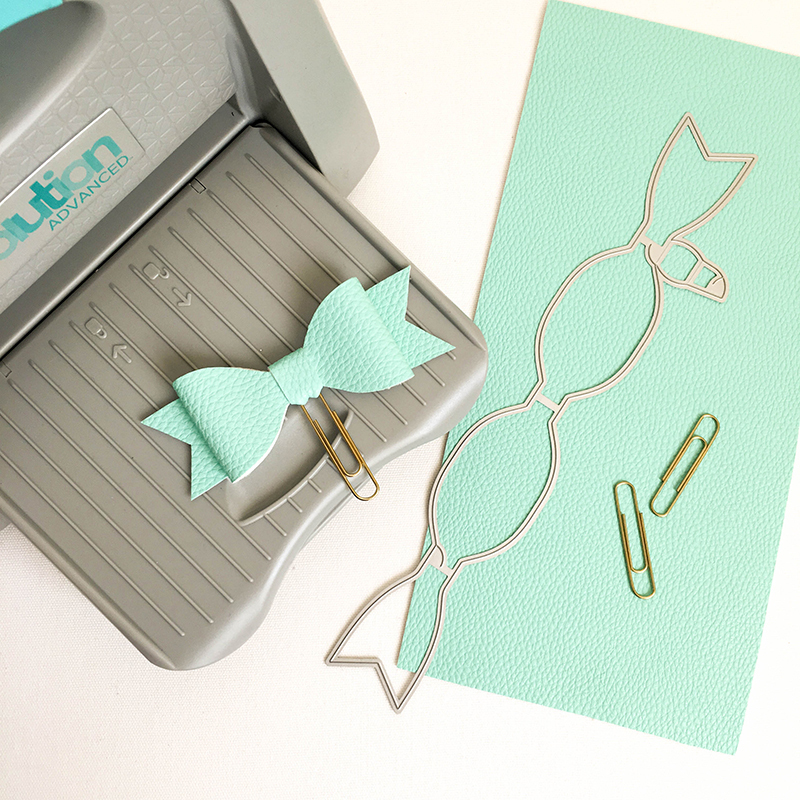 You can create awesome things when you use your tools in different ways! Hello We R friends, and welcome to Frame Punch Board Week! 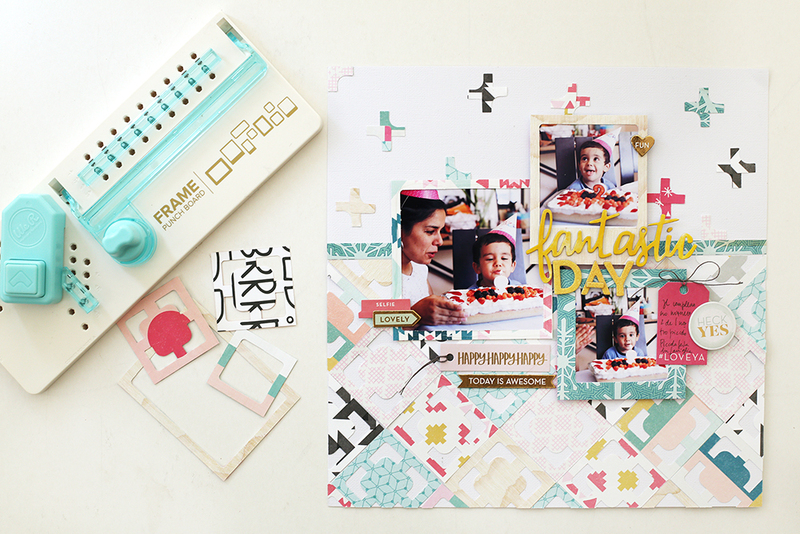 Each day this week our design team will share an inspiring project tutorial with you featuring the Frame Punch Board. Be sure to come back often so you don’t miss anything. 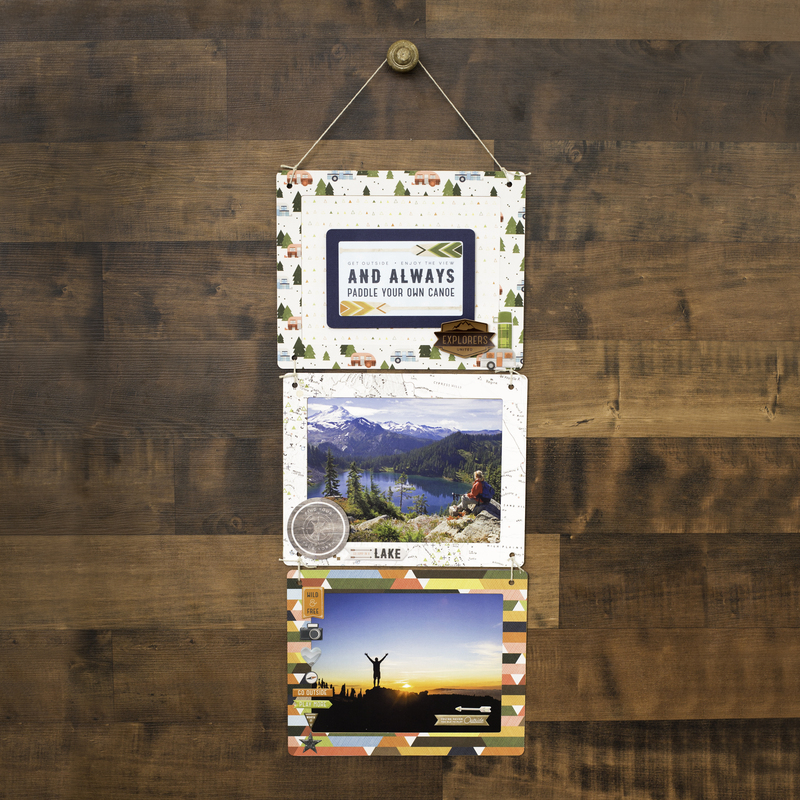 Today we’re sharing some Frame Punch Board project inspiration from our talented in-house design team. Enjoy! 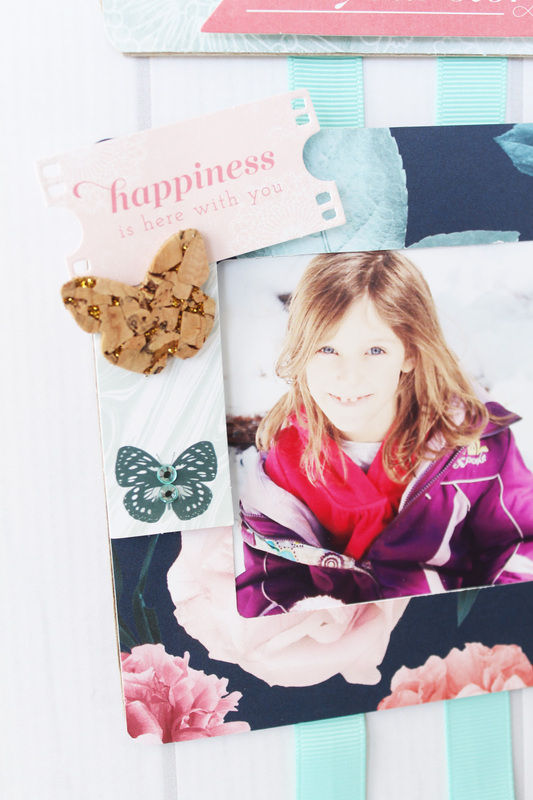 While the Frame Punch Board is perfect for highlighting your favorite photos, it’s great for layering patterned papers on cards or layouts. 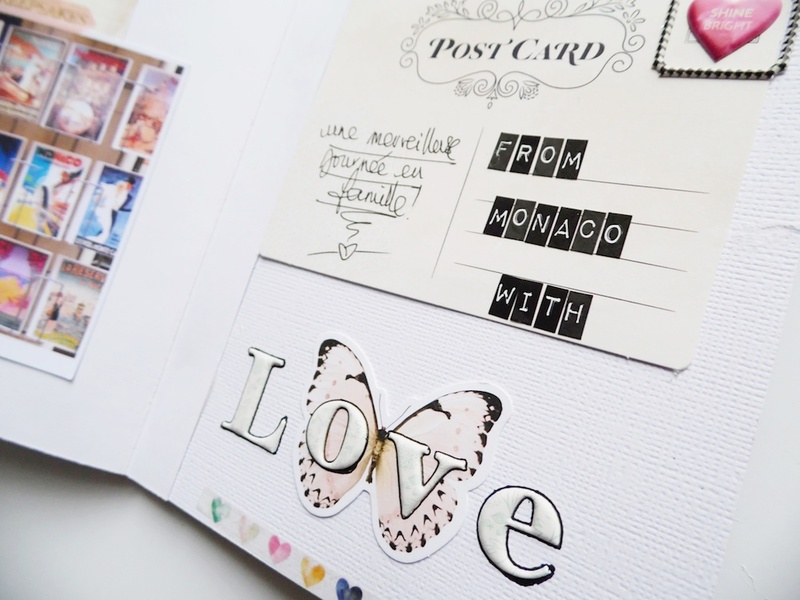 The Frame Punch Board is also ideal for featuring card sentiments, journaling, focal embellishments and page titles. 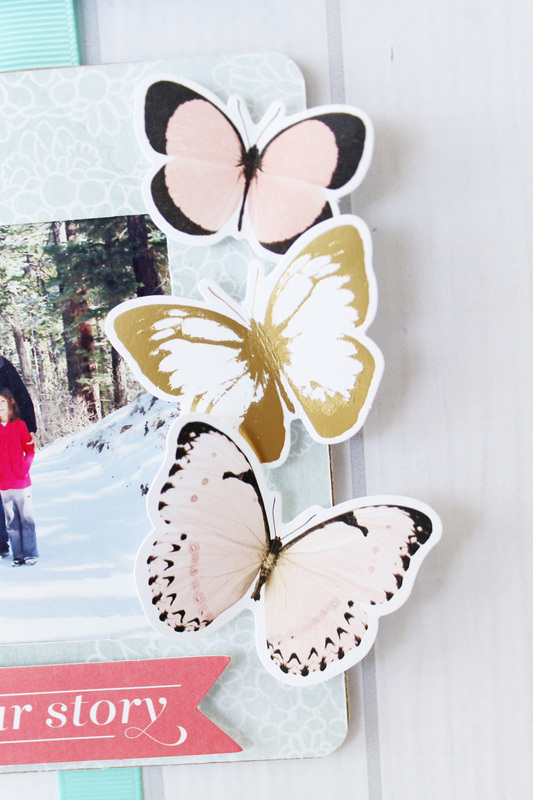 Create concentric frames to help make your photo a strong focal point on your layout. We hope you’ve enjoyed the projects we shared with you today. Be sure to come back each day this week to see some more awesome inspiration from our design team! 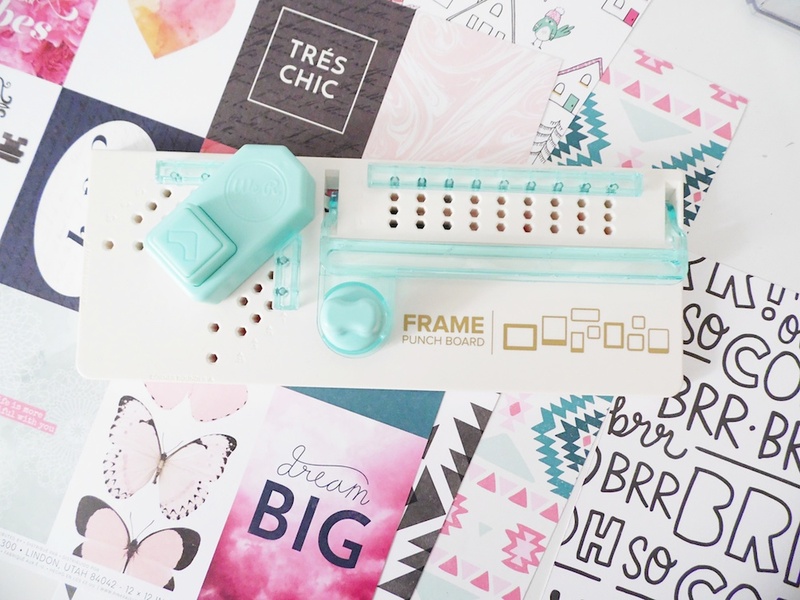 So, we want to know…how would you use the Frame Punch Board in your paper craft projects? Hello friends, it’s Aly Dosdall here today! 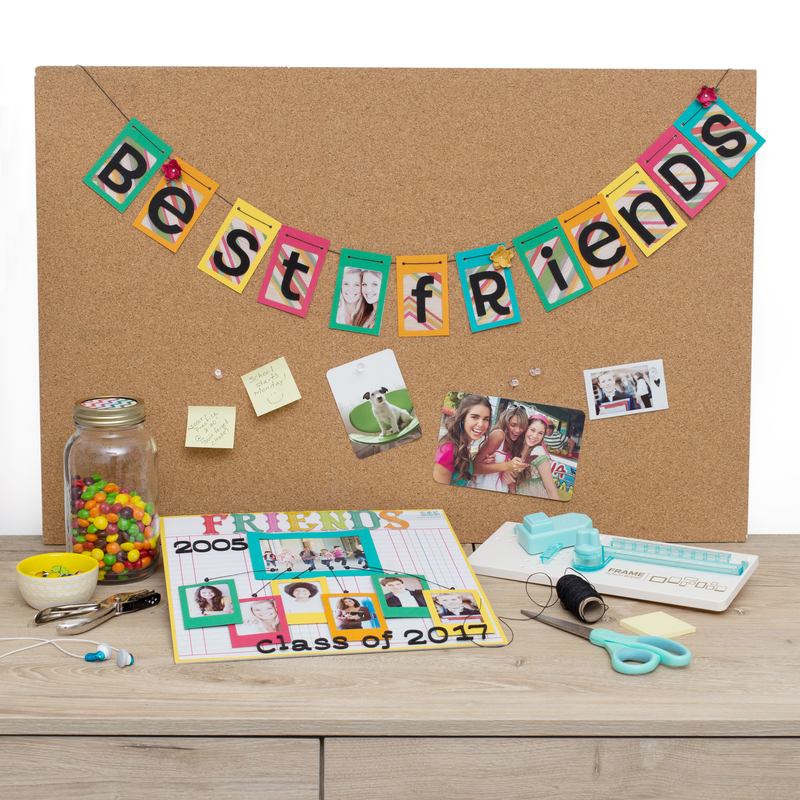 I’m so excited to share my DIY Party Board project with you. I decided to create something with a bit of a twist. 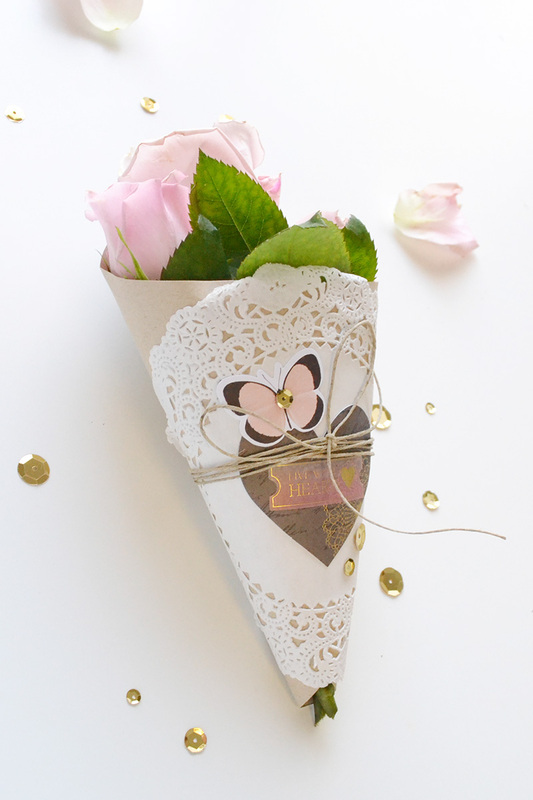 I used one of the standard partyware items (treat pouch) and turned it into a pretty floral wrap! I followed the directions in the included instruction booklet to make a treat pouch. I cut my 12×12 kraft cardstock to 9×9 inches. 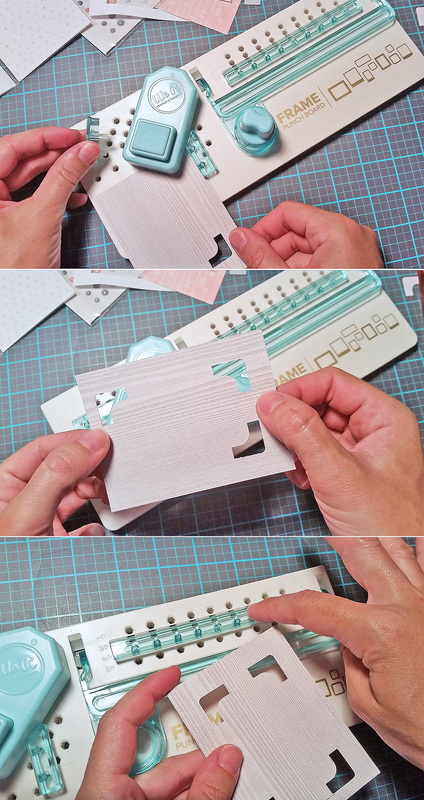 Then, according to the directions, I used the A guide on number 11 to cut the paper into the required shape. 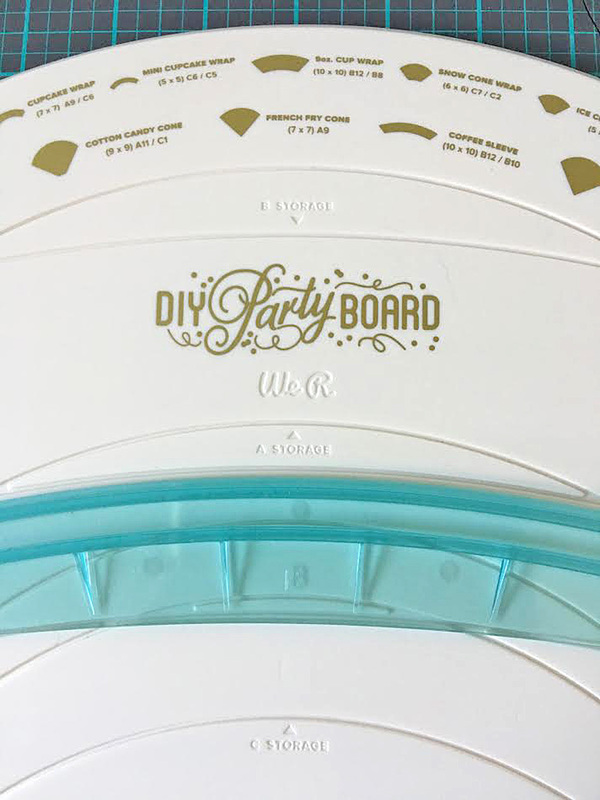 To watch an overview video of how the DIY Party Board works, CLICK HERE. 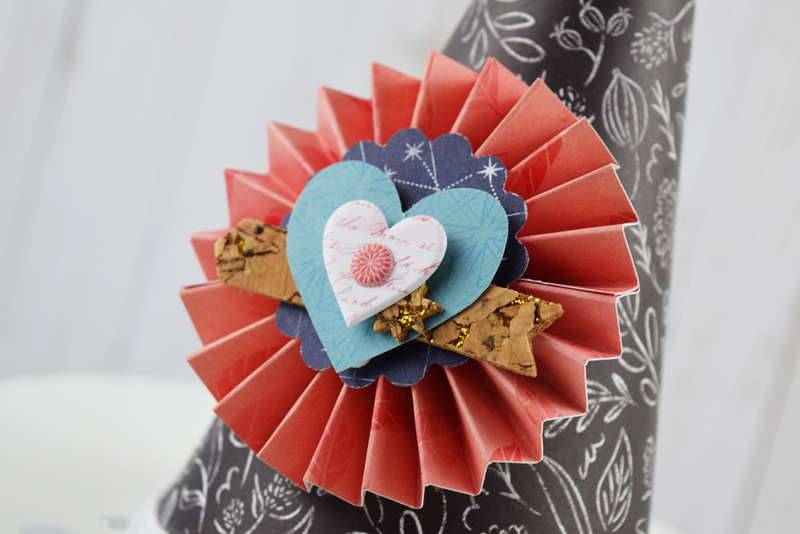 I used my Red Double Sided Sticky Thumb tape (my favorite for 3D projects) to adhere the paper into a cone shape, and then added a white paper doily, some twine, and embellishments. Finally, I added some pale pink rose buds and greens so I can take it to a friend who needs a little sunshine in her life. 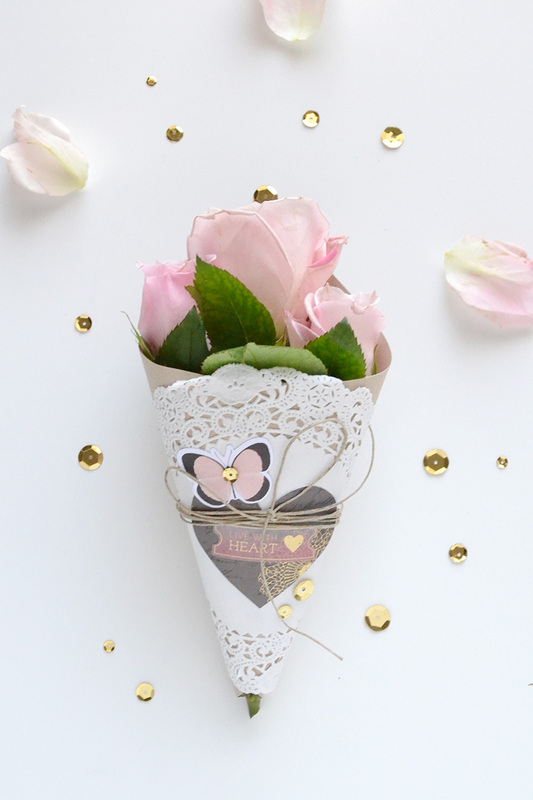 This floral wrap is perfect for a friend or neighbor gift, a bridesmaid gift, wedding decor, bridal shower decor, or for an anniversary party. 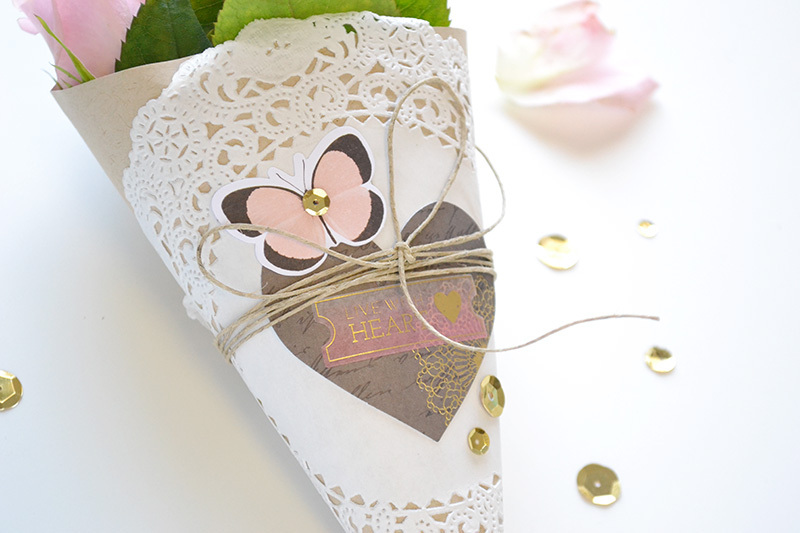 You could also add some ribbon and hang one on your door for a spring door hanger. 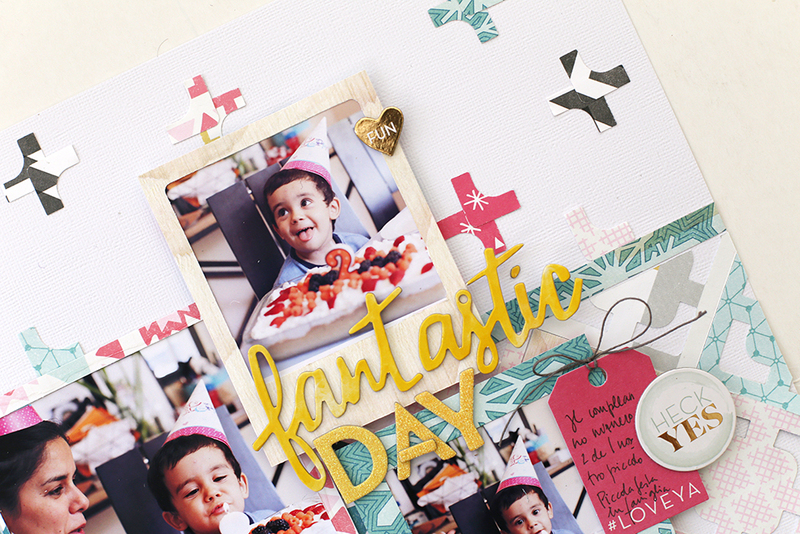 Thanks for joining me today, and I hope you have fun making DIY Party Board creations! Hello We R fans! Kimberly here with a confession. I have a thing for cake stands. It’s bad. I have many of them. Many, many cake stands. 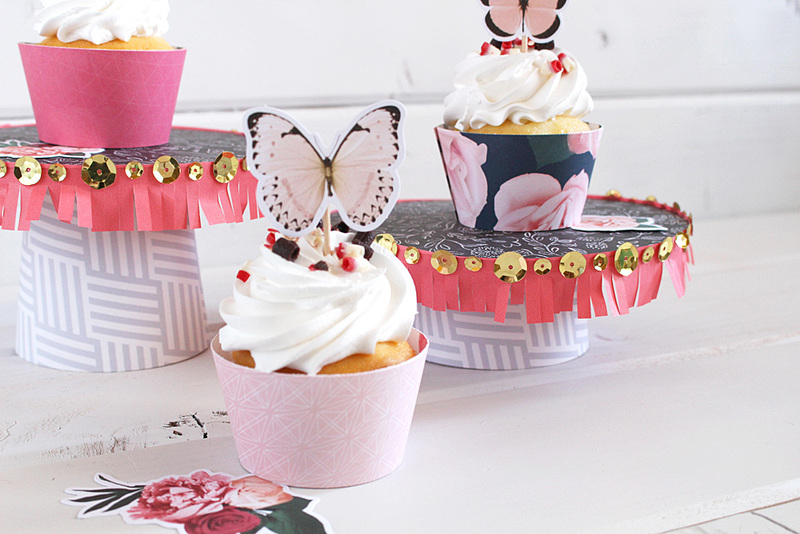 Once I saw the cool things you could create with the DIY Party Board, my mind instantly thought, hey, maybe I could make a cake stand with it! 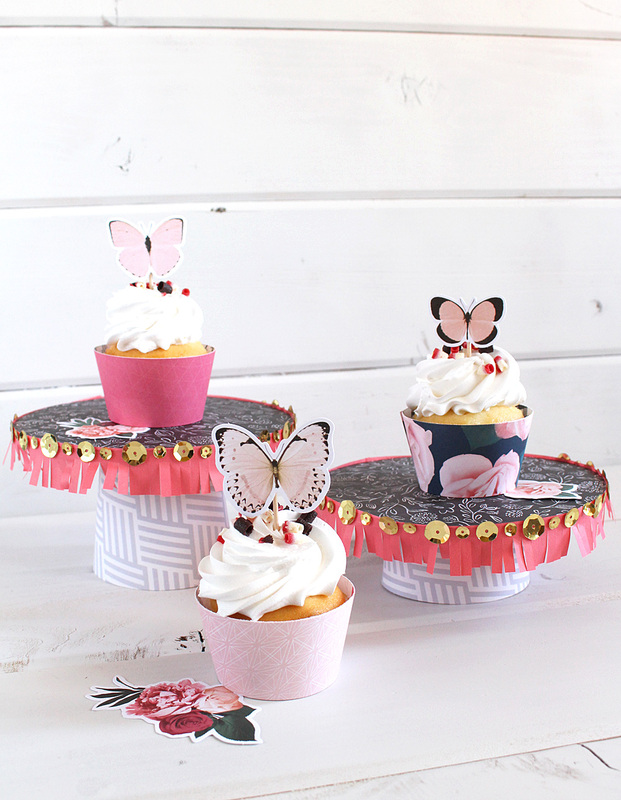 These easy and adorable cupcake stands were a snap to create. No, really! 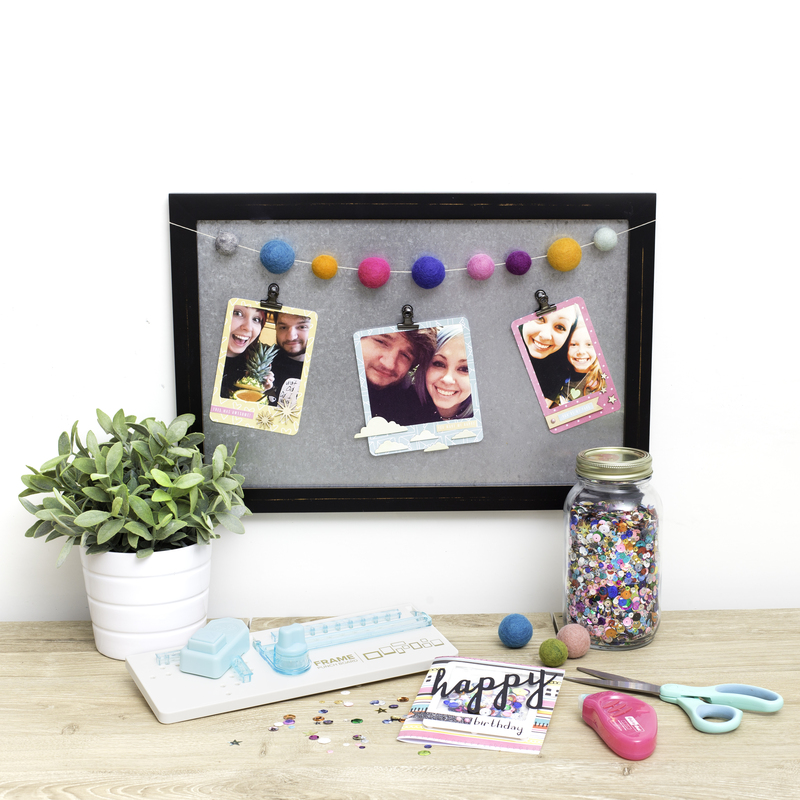 Take a closer look at the DIY Party Board. It has the guide labels and placements for each project on the board! 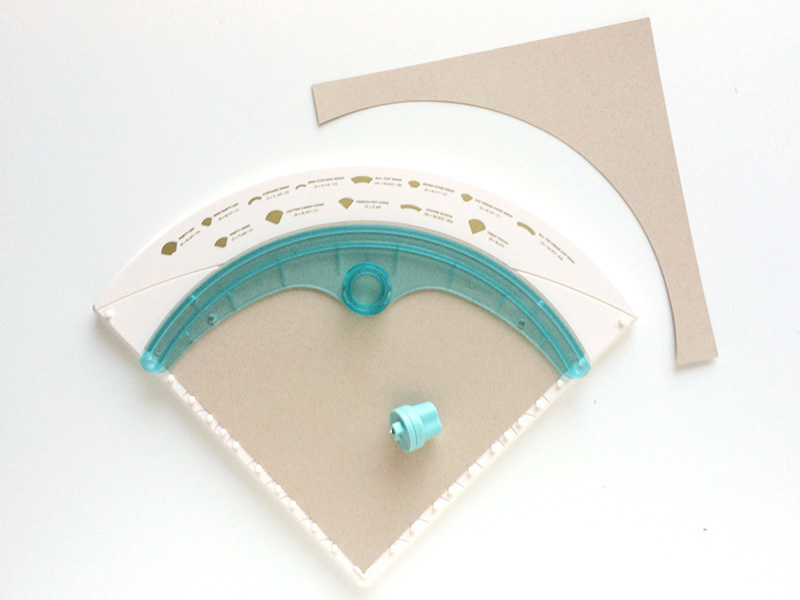 There are three moveable guides, all clearly labeled A, B, or C. The cutting blade fits inside each one, but stores in the A guide. 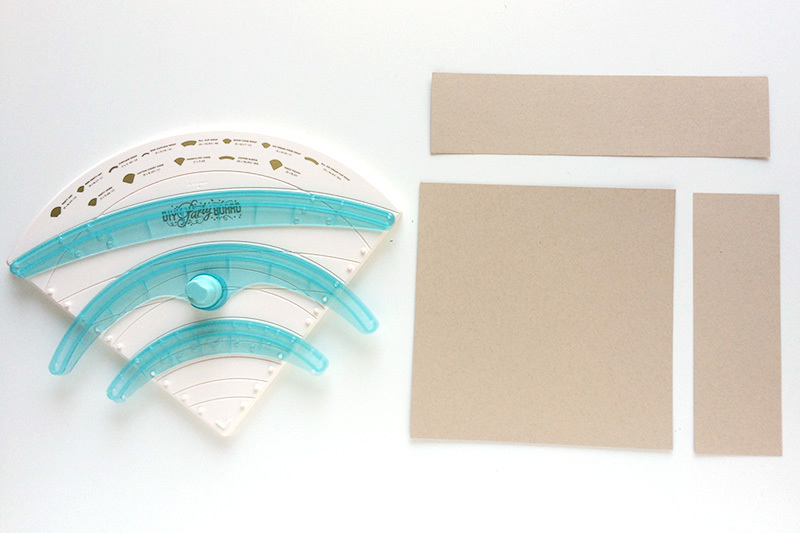 The instruction book, included with the board, lists what size piece of paper you need for each project. 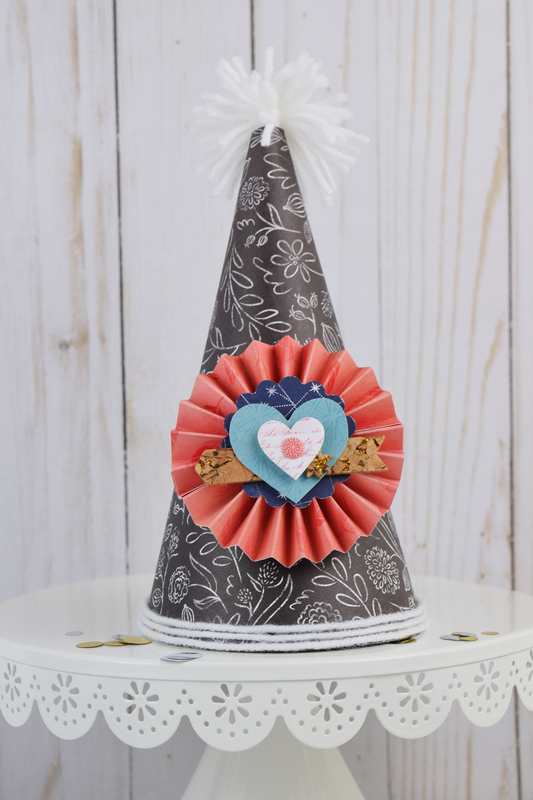 To create my taller cupcake stand, I used the dimensions for the 9-ounce cup cover. 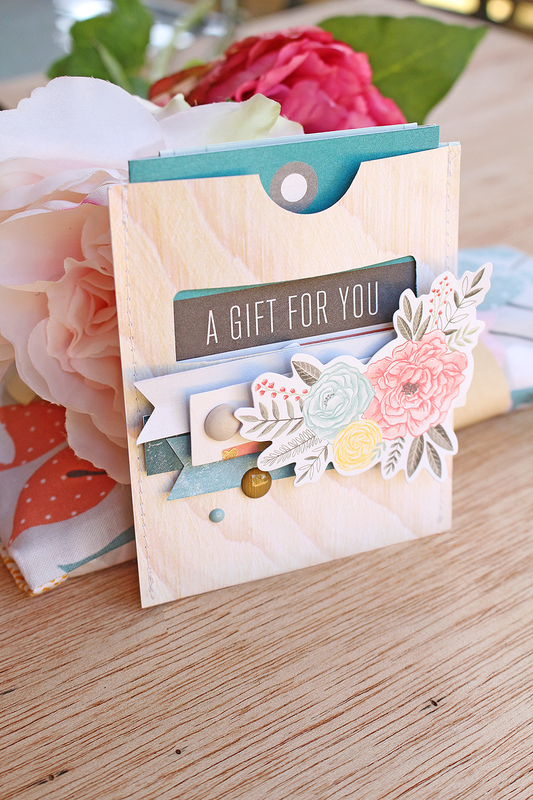 I placed my Pink Paislee Moonstruck patterned paper in the corner, as shown. Then I placed my guide. The guides and the board are labeled for easy movement. And I love the pegs that hold the guides in place. There was never any slipping while cutting! 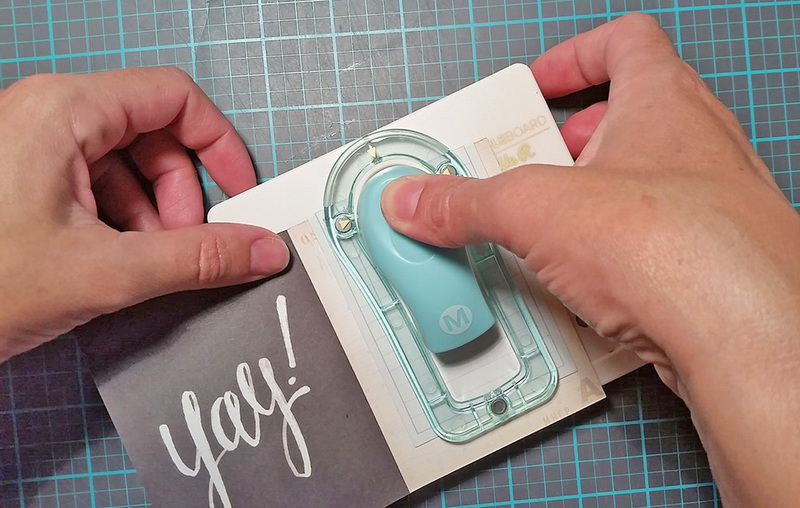 You can see how the blade fits in the guide and cuts a perfect line. I repeated the same process for the shorter cupcake stand, using the dimensions for the 8-ounce ice cream cup cover. Once the paper was cut, I used Doubled-Sided Super Sticky Red Tape to hold the ends in place. A very strong adhesive is needed to keep the two sides together when being used as a base like this. 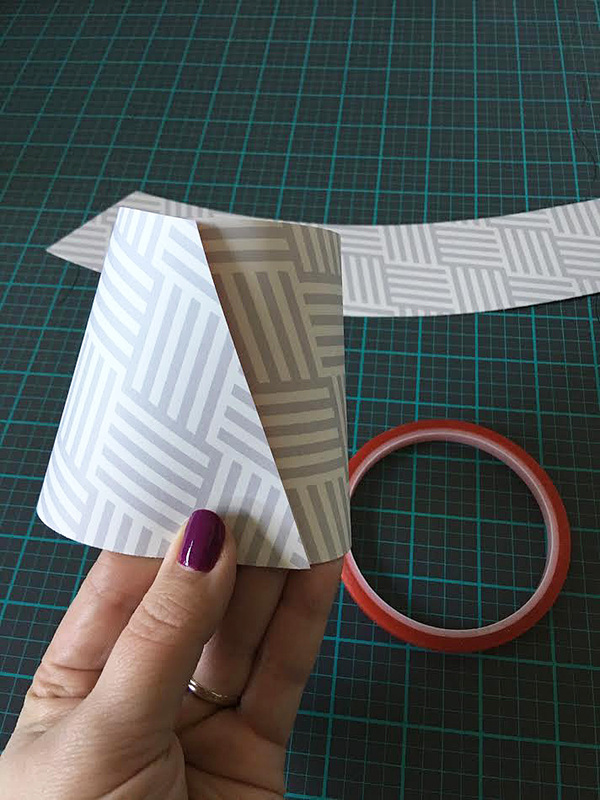 The two ends of the cut patterned paper line up perfectly along the top and bottom, when they are the correct dimensions. So simple. 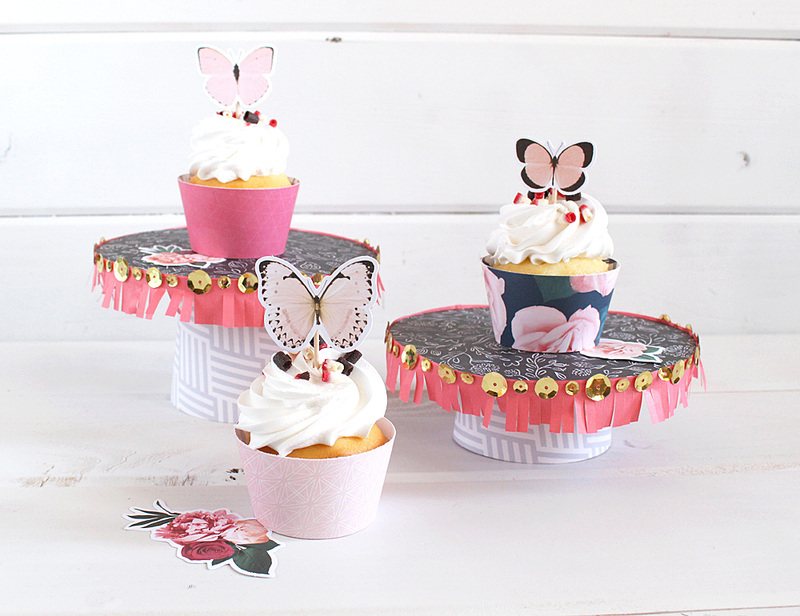 To create the tops of the cupcake stands, I traced a small plate onto thin chipboard and then on Pink Paislee Moonstruck Chalkboard Floral patterned paper. The chipboard I used came from a cereal box. It added extra stability to the top, to support the cupcake. Around the narrower end of the cup shapes, a line of glue from the Mini Cordless Hot Glue Gun was added. Then I placed the cup, or now the base, onto the underside of the top. 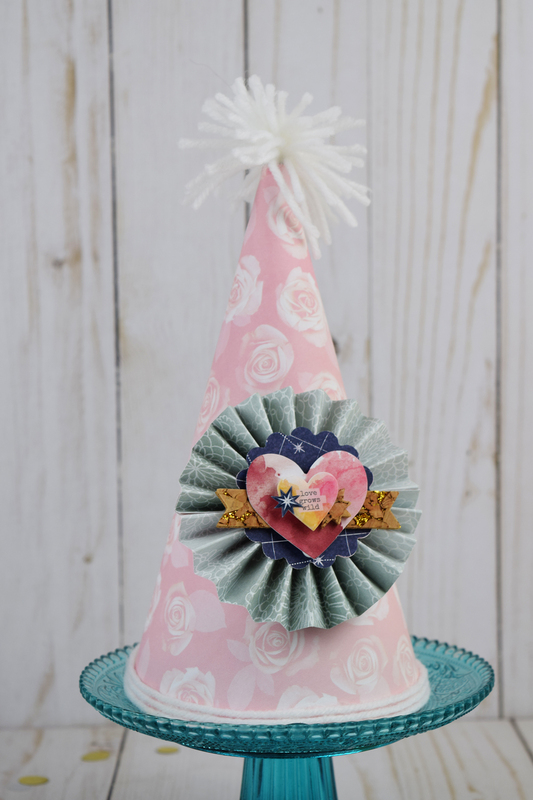 By doing this “upside down,” it allows the base to settle into the top, and to be much more accurate when attempting to get the base in the center. 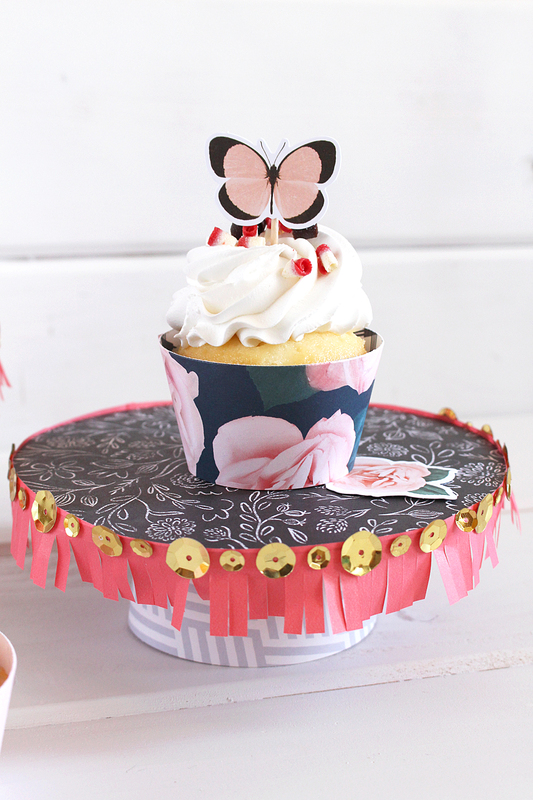 DIY Party Fringe Tape was adhered around the outside edge of the cupcake stand top. Sequin Stickers were also added. 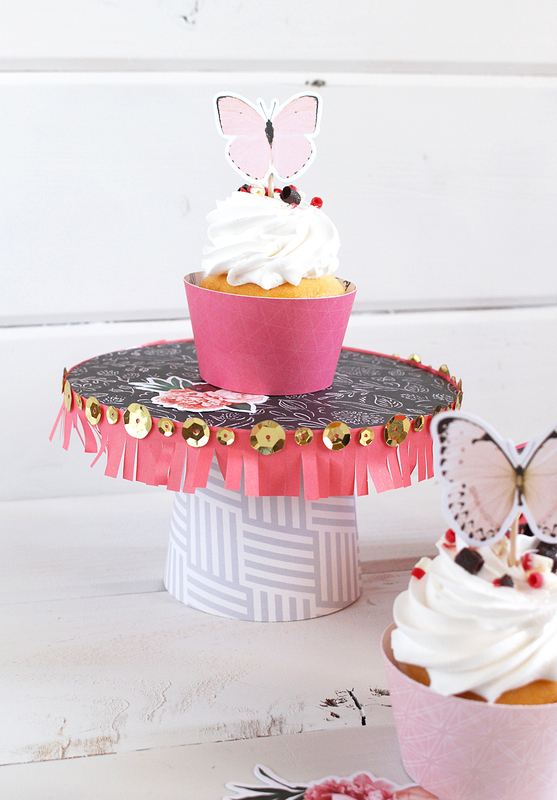 Pink Paislee Moonstruck Ephemera was used to create the butterfly cupcake picks. 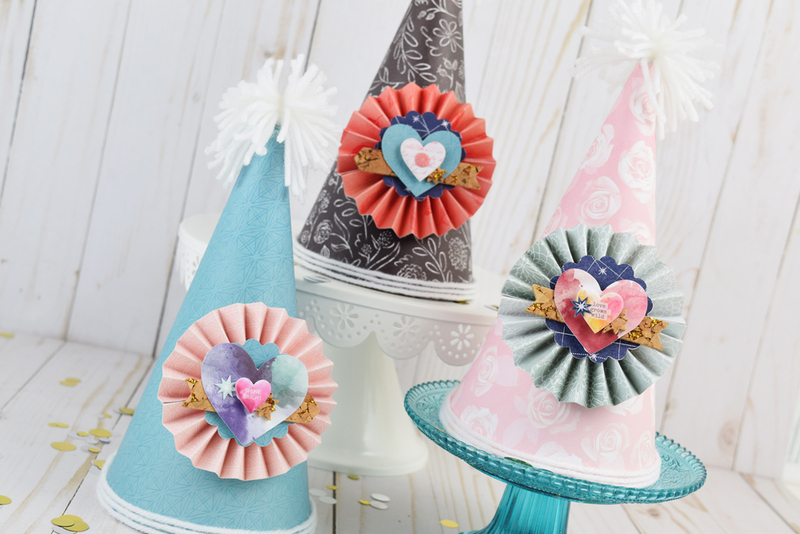 And, because the DIY Party Board also creates cupcake wraps, I had to wrap these in more patterned paper from the Pink Paislee Moonstruck collection. 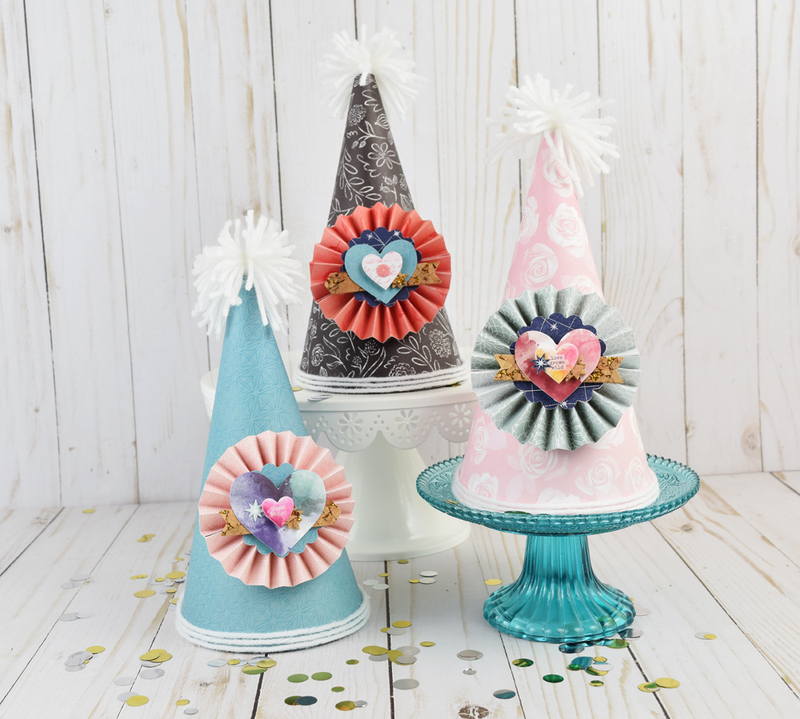 What celebration will you create cupcake stands for?